This has been a busy week full of painting projects, Burma research, summer gardening, and print designs! Today, I’d like to share more images with you from our travels through Upper Burma– truly one of the most unique places I’ve ever been to. Some photos just work better in black and white. Here is a collection of those images with accompanying descriptions. So much of the designs for the Thailand Burma Flora Fauna project have been influenced by what I saw and felt during my travels in Burma. I appreciate all of your feedback and your reaching out to me. Thank you all so much for your continued support! Men driving an old diesel tractor through the center of Nyaung Shwe, on Inle Lake. 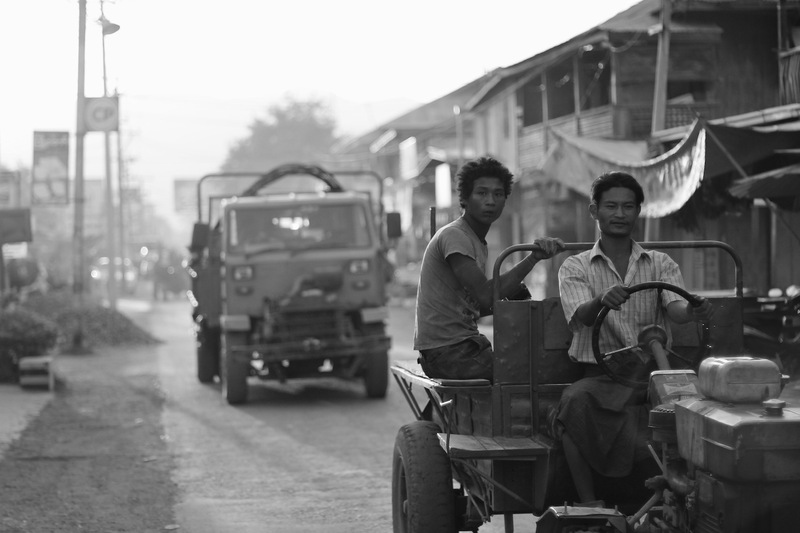 It is not uncommon to see vehicles from another era still in everyday use in Burma. Dusk view of Mandalay from Mandalay Hill. 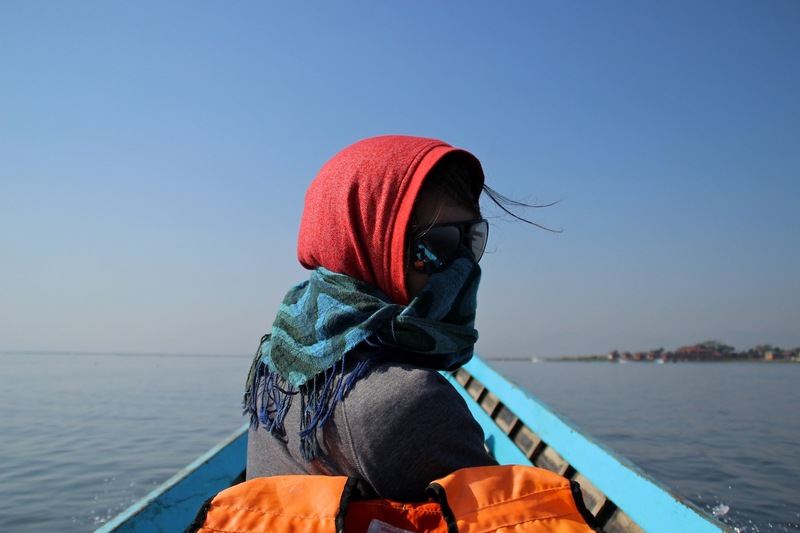 You can see the Irrawaddy River shining on the horizon. It’s the main artery that runs through Burma all the way to the Andaman sea. 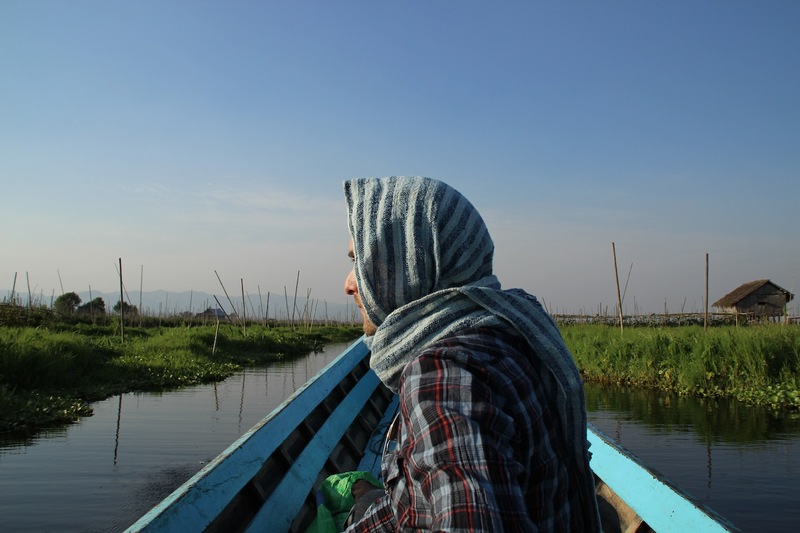 Beth and I on the canal in Nyaung Shwe, on Inle Lake, Burma. 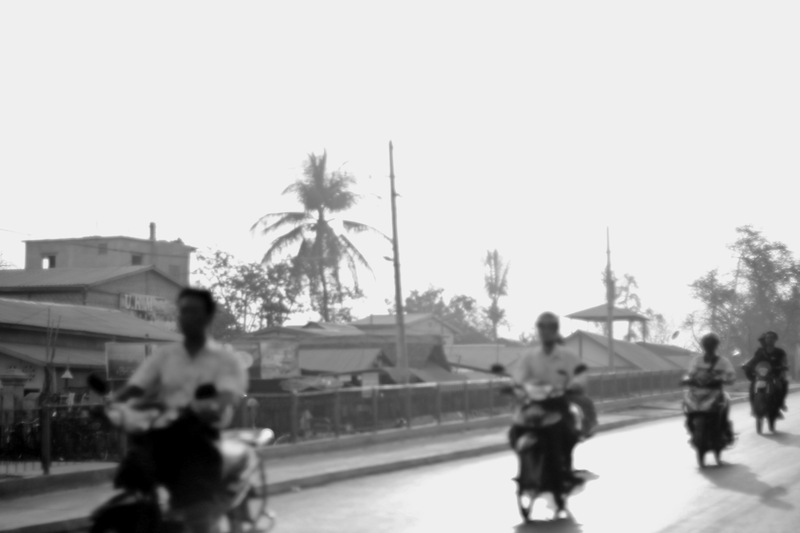 Street snap of men on motorbikes at sunset, Mandalay. There is a small mountain town on Mt. 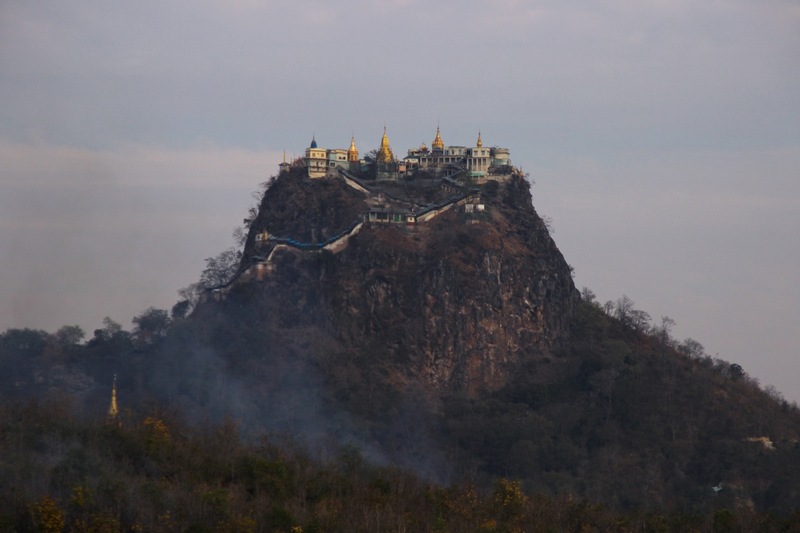 Popa, a forested volcano topped with a monastery, that is overrun by tribes of naughty monkeys. 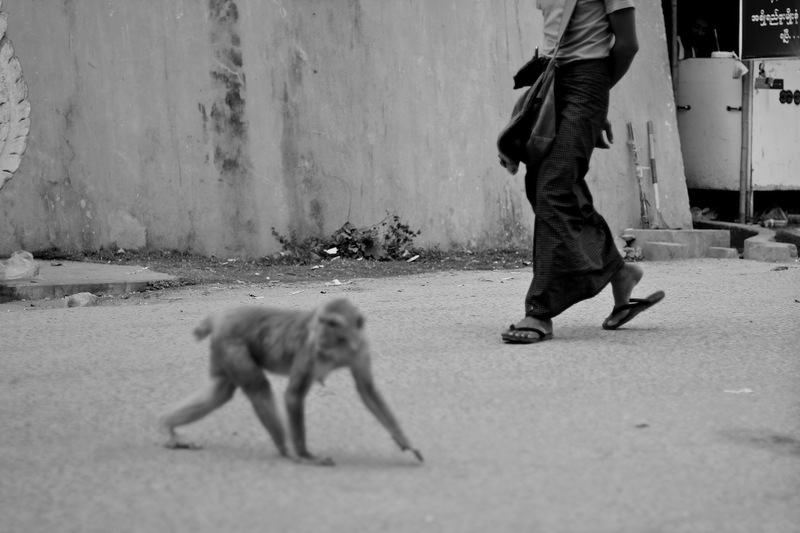 Our guide said, “The monkeys here… they can be quite rude.” I concur. Many residents walked with sticks to fend them off. 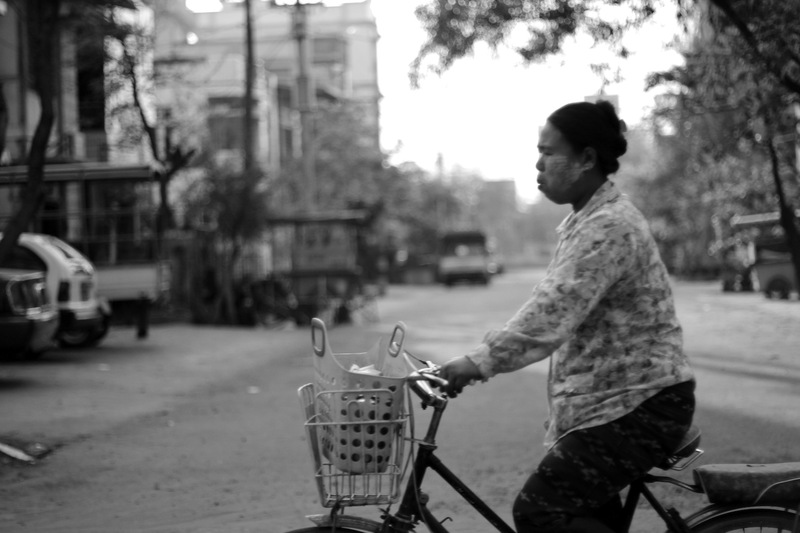 Street snap of a woman on a bicycle, Mandalay, Burma. 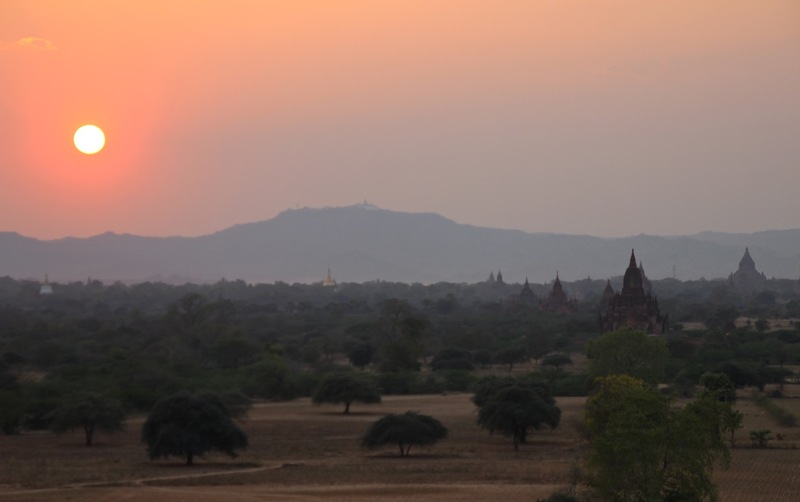 Morning on the Bagan plain– a valley of ancient ruins in Bagan, Burma. Novice monks in a temple in Bagan, Burma. 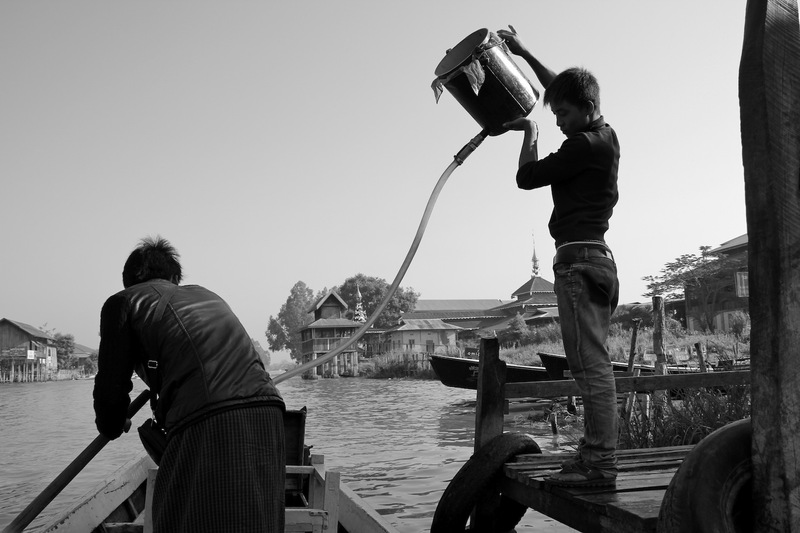 Filling up at the gas station on Inle Lake, which was comprised of a young boy on a wooden dock with a bucket of gas and a hose. Why not? View of Mandalay in the morning from the Smart Hotel. 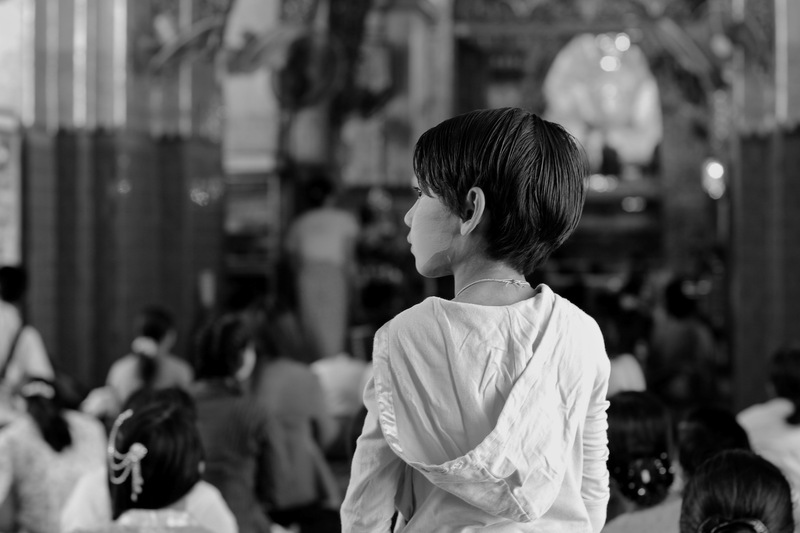 In a golden temple in Mandalay, a young girl is wearing thanaka, a yellow-white-gold colored cream that many Burmese folks wear on their faces. Thanaka is part sun screen and part cosmetic product. It is made from the ground bark, wood, or roots of various trees. 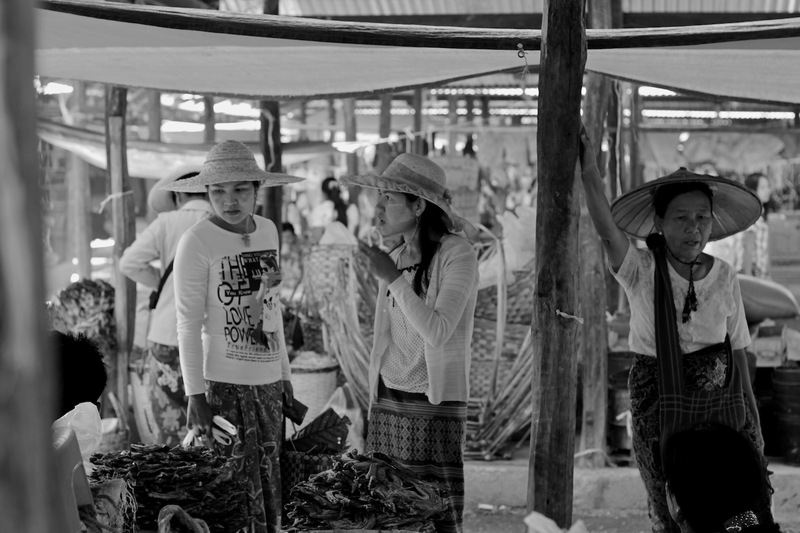 Some ladies hanging out and chatting at the morning market in a small village on Inle Lake. Note: each of them is wearing thanaka on their cheeks. Thank you all so much for your continued interest and support of the Thailand Burma Flora Fauna project! 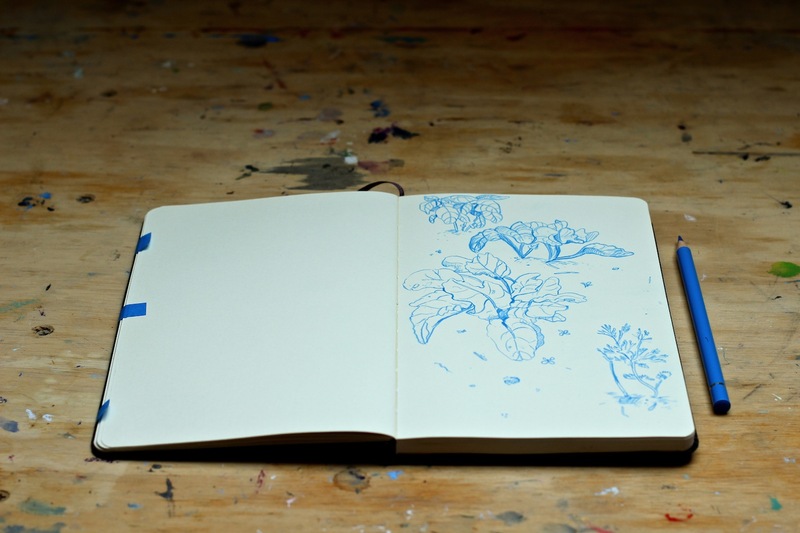 Portland: Drawing, Books, and Printmaking! Portland – In early June I returned to Portland, Oregon where I’ve been busy balancing various projects, steadily working on print designs, and reading up on Burma. Earlier this week, I met with some extraordinary local printmakers to discuss printing methods, the finer points of paper varieties, and a production timeline. 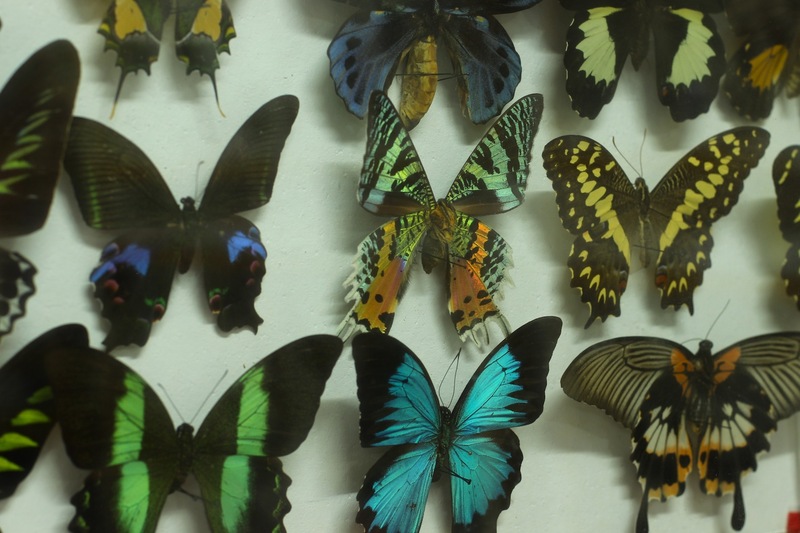 It’s really exciting that the Thailand Burma Flora Fauna project has entered this stage of production. Thank you all for your continued interest and support with this endeavor! 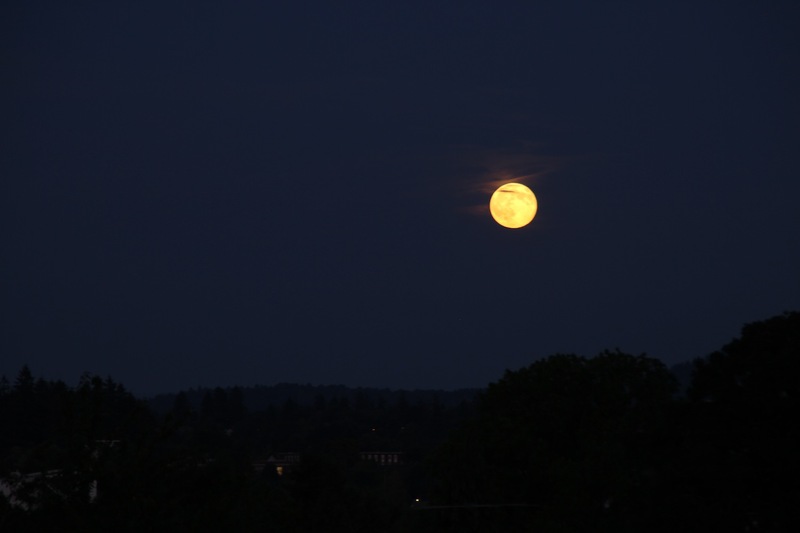 Supermoon rising over Portland, Oregon – June 2014. Asian Elephant – After struggling with a design which first featured an extinct variety of rhinoceros and then later the Asian Elephant, I finally abandoned it and went back to the drawing board (quite literally) to rework the picture. Finally, the newer image feels like it’s on the right track! 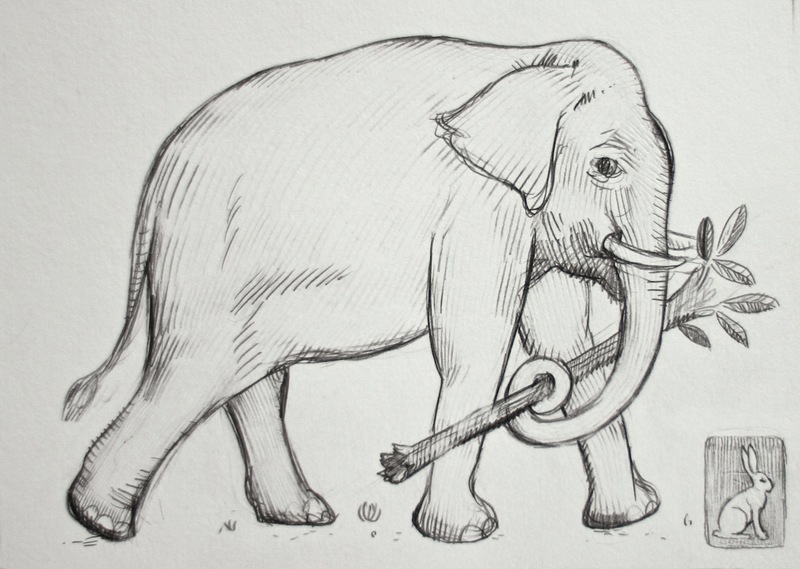 Sketchbook drawing of an Asian Elephant carrying a branch – getting closer! 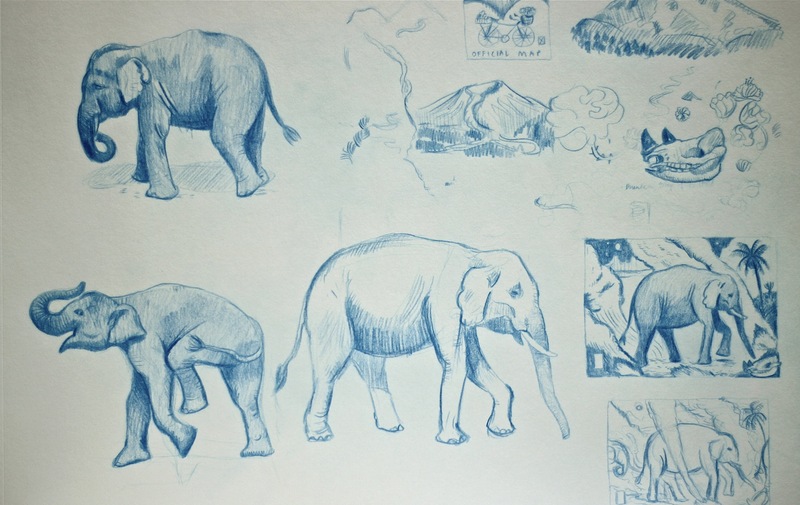 Drawing the muscle movement of elephants + thumbnail compositions in my sketchbook. 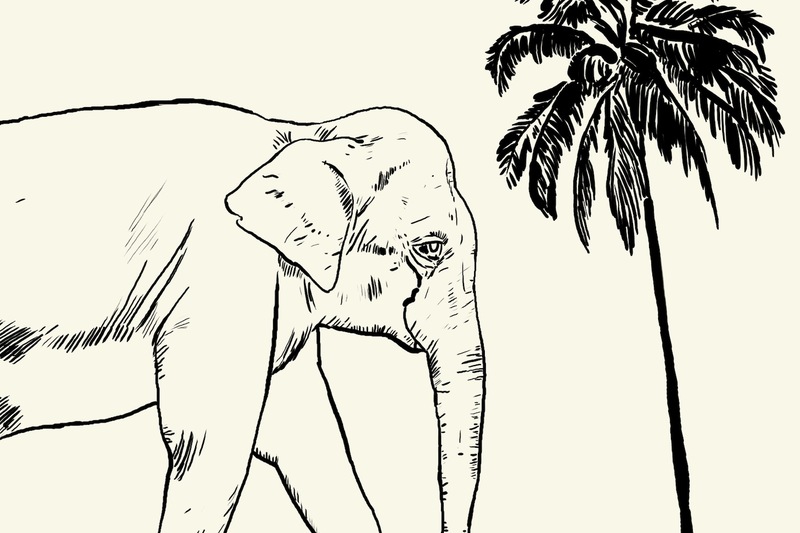 Work in Progress (WIP) – an older version of the print featuring an Asian Elephant. 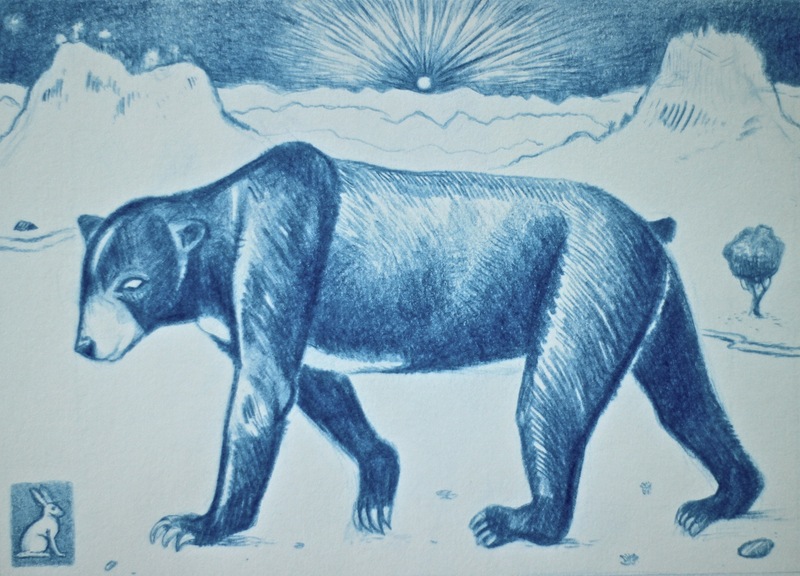 Sun Bear – The design for a print featuring the elusive Sun Bear is nearly complete! For now, here are some detail images. 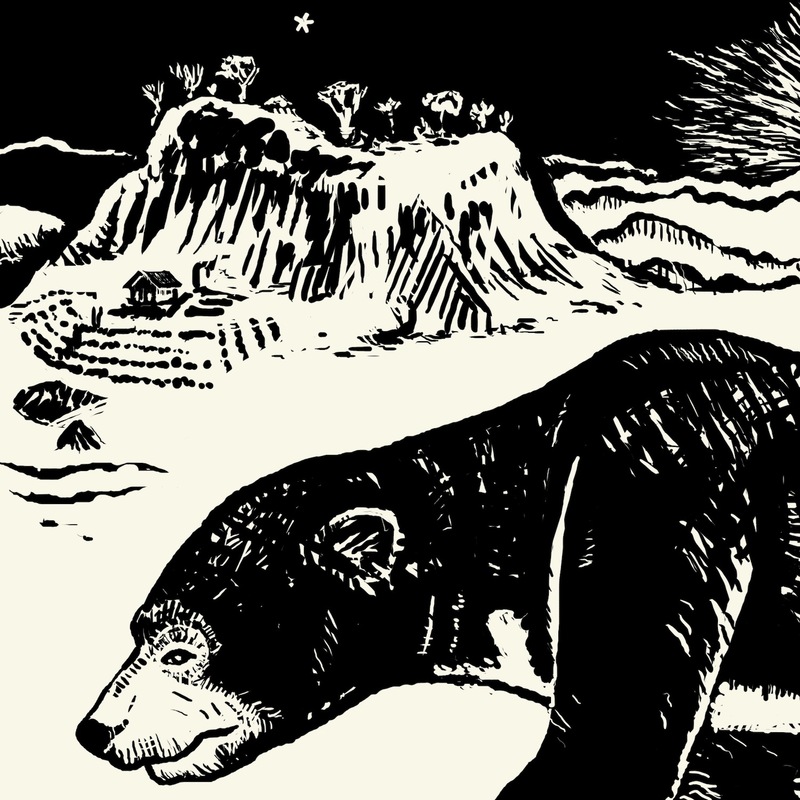 WIP – The sloping head of the elusive Sun Bear with a Burmese landscape. Preliminary sketchbook drawing for the Sun Bear print. 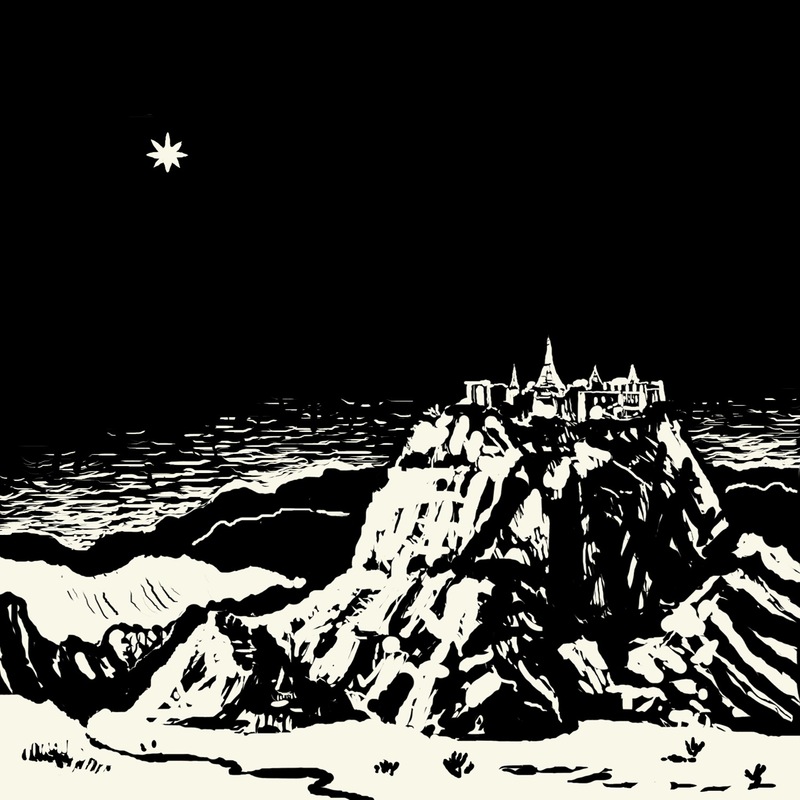 WIP – This print features a hilltop monastery based on Mt. 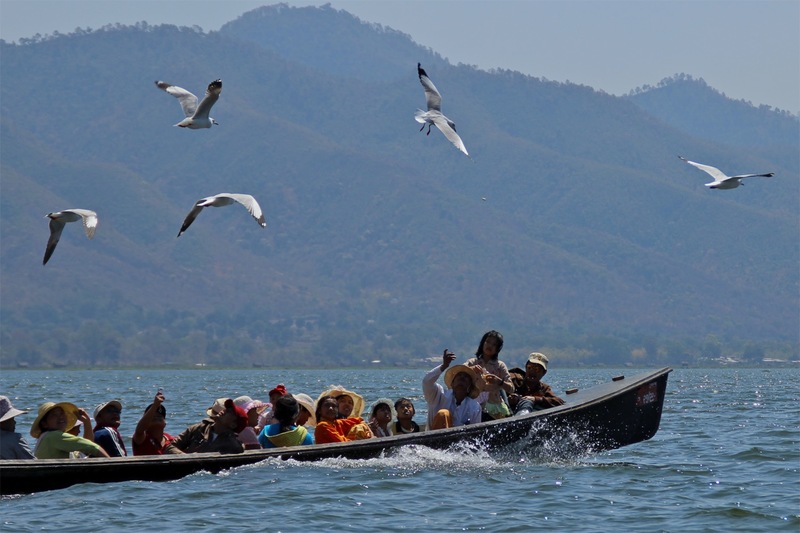 Popa, a favorite place we visited in Upper Burma. Working on imagery for the additional print for those who increased their pledge. Garden Drawings –This summer so far, I have been spending my off-time gardening and growing vegetables. It’s been enjoyable to draw from the garden as well. 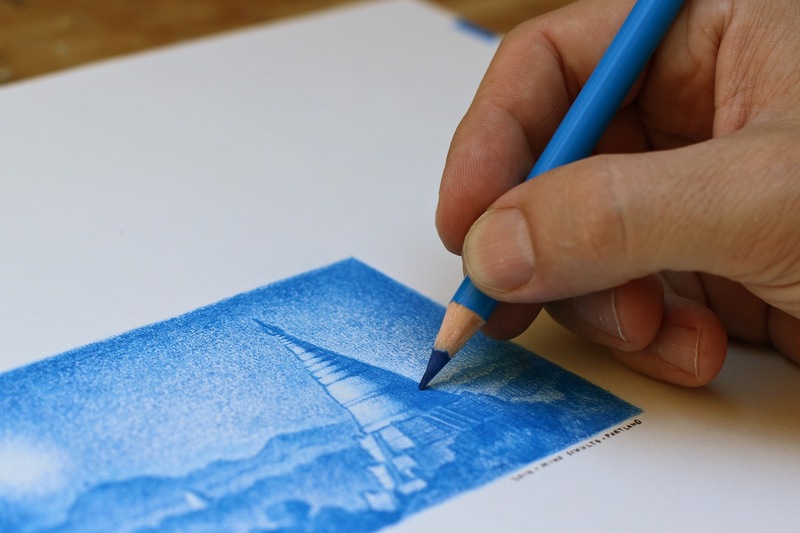 If you can’t tell, I’m really into sketching with a cheerful blue color these days. Sketching basil, chard, and carrot tops in my garden. July, 2014. 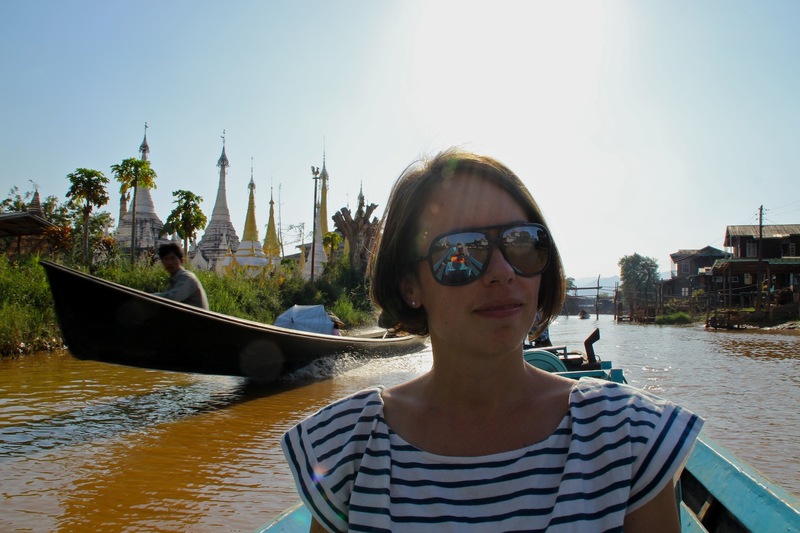 Reading – Part of the way I’ve been processing my reverse culture shock (it’s a thing!) and reflecting on this recent time spent in SE Asia has been by avidly reading about Burma and its history. Curiously, it seems that the more I seek to understand about Burma, the less that I actually know. 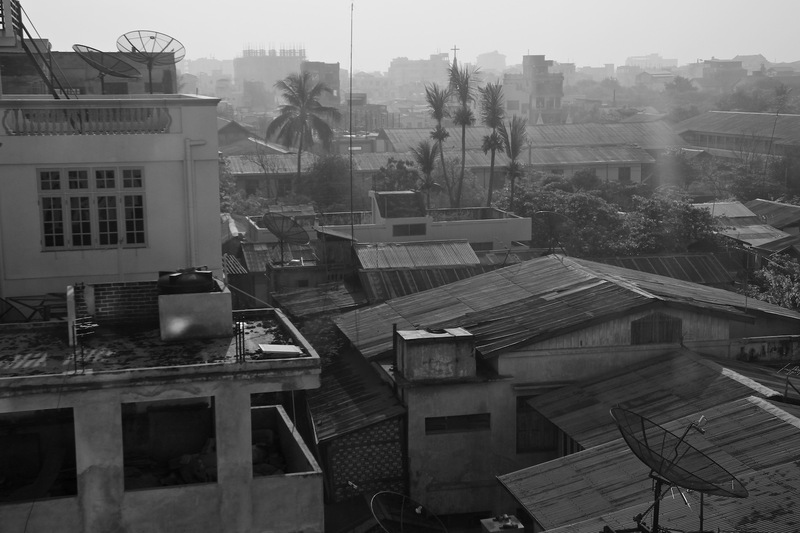 While the history of any single subject is bound to be complex, for me the shaping of present day Myanmar, seemingly the result of an endlessly labyrinthine trajectory of events, is particularly captivating. 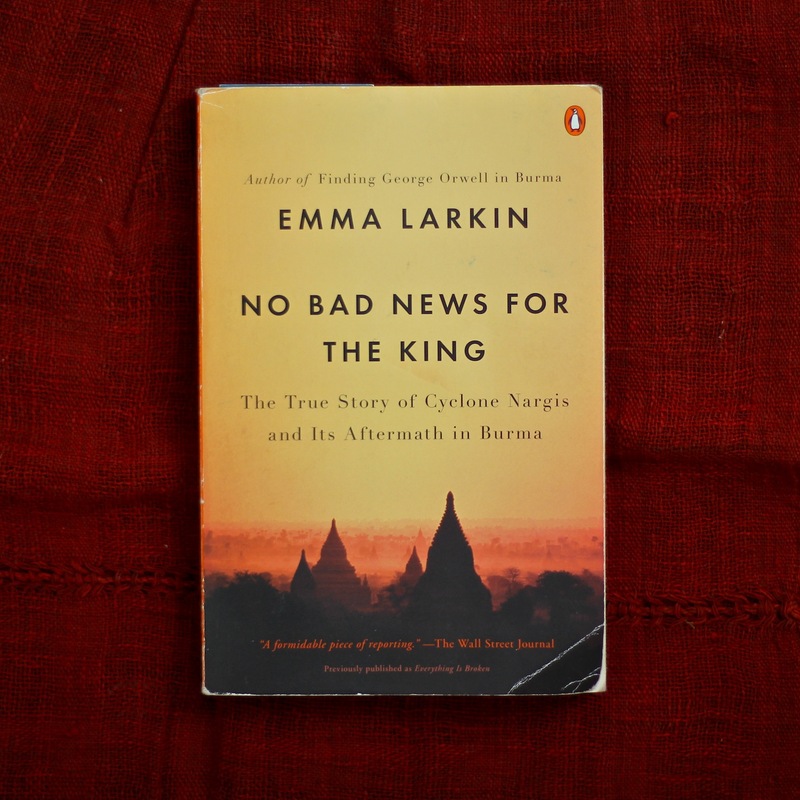 Books – For those of you who would like to broaden your understanding of Burma, I highly recommend reading the two books, in particular. This spring and summer I read Finding George Orwell in Burma and No Bad News for the King— both fascinating and well written documents. No Bad News For the King details the affects of Cyclone Nargis, which claimed 138,000 lives. Upon returning to Portland, I reread Burma Chronicles, by Guy Delisle and Quartered Safe Out Here, a WW2 memoir by a Scottish solider named George MacDonald Fraser. Reading Quartered Safe Out Here was a bit too much like eating lunch at the local V.F.W. with my grandfather in the early 1980’s. I also attempted to read some much hyped fiction, The Piano Tuner, but it just wasn’t for me. Currently, I’m reading 30 Heritage Buildings of Yangon. What I love about this book is that it is a positive and crystal-clear presentation of the current state of heritage architecture in Burma’s former capital city of Yagon. It offers not only a concise history 30 unique buildings, but also details the potential of these structures available for restoration and renovation. Any one of them could join the ranks of the Strand Hotel, a Yangon landmark– that is, if they are not torn down to make way for newer construction. Follow this link to watch a video of The Strand Hotel. 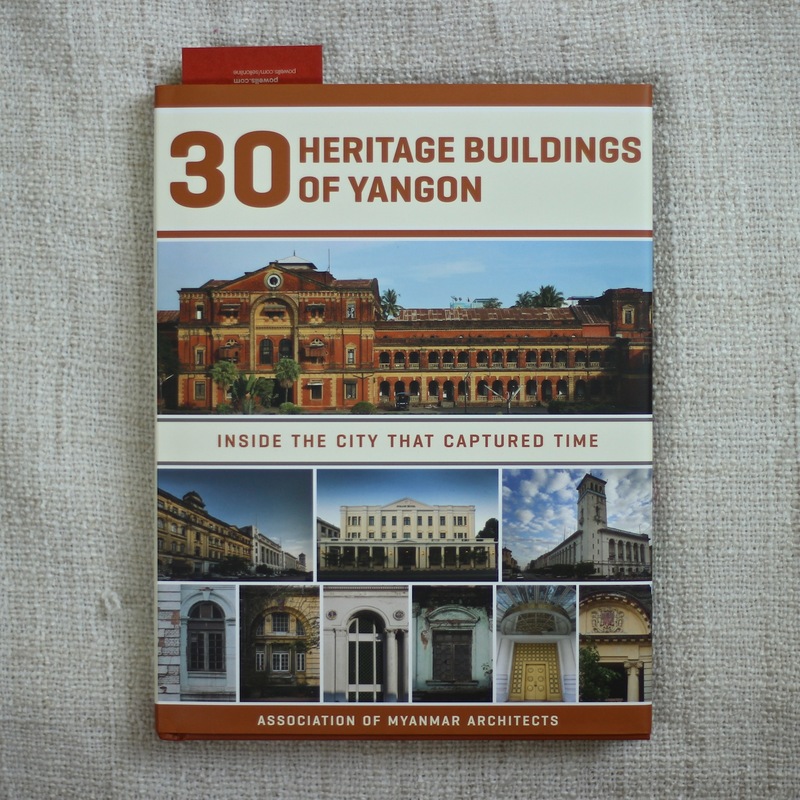 30 Heritage Buildings of Yangon is a great read so far! Also, I am currently reading two 100+ year old books authored by V.C. Scott O’Conner. Those books are The Silken East (1904) and another called Mandalay, and Other Cities of the Past in Burma (1908). 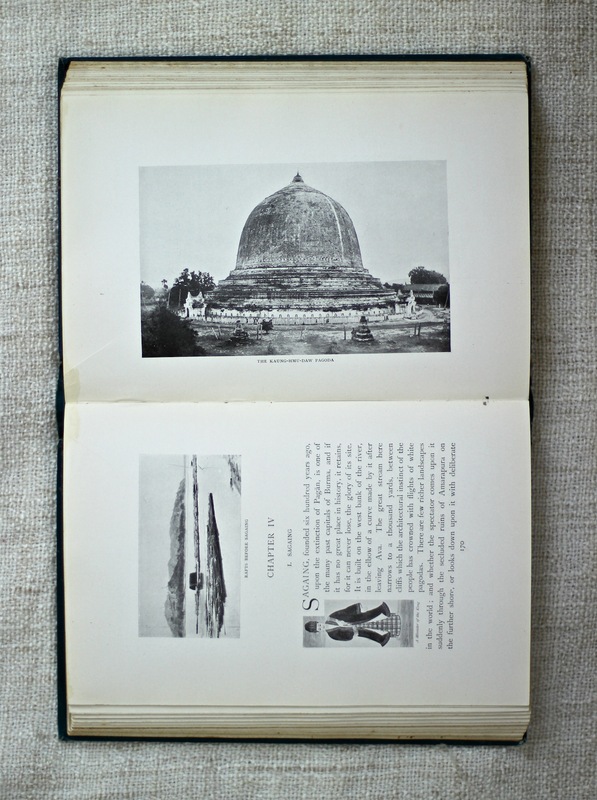 I was lucky to find an original 1908 copy of Mandalay, and Other Cities of the Past in Burma (1908), which boasts beautiful photos like this one taken by the author. The lens through which V.C. 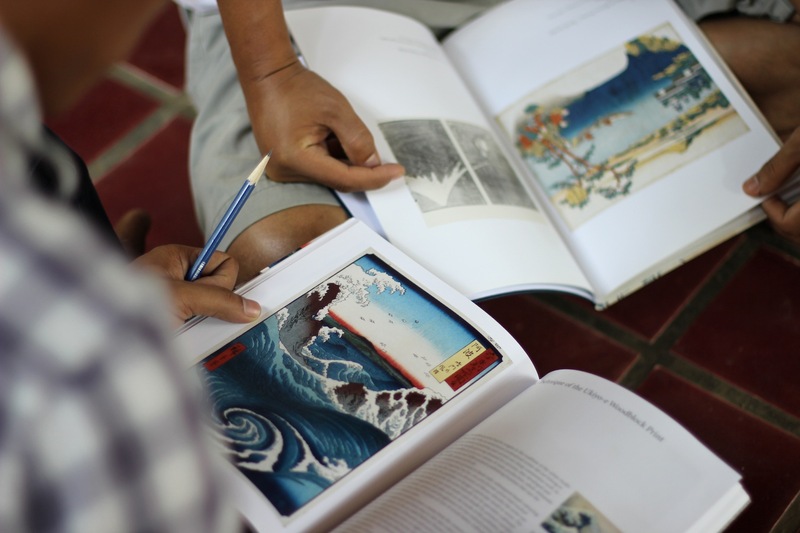 Scott O’Conner wrote is now outdated, but none-the-less his books are filled with his fascinating photographs and oral histories that he learned while holding government appointments in Burma in the 1890s. V.C. 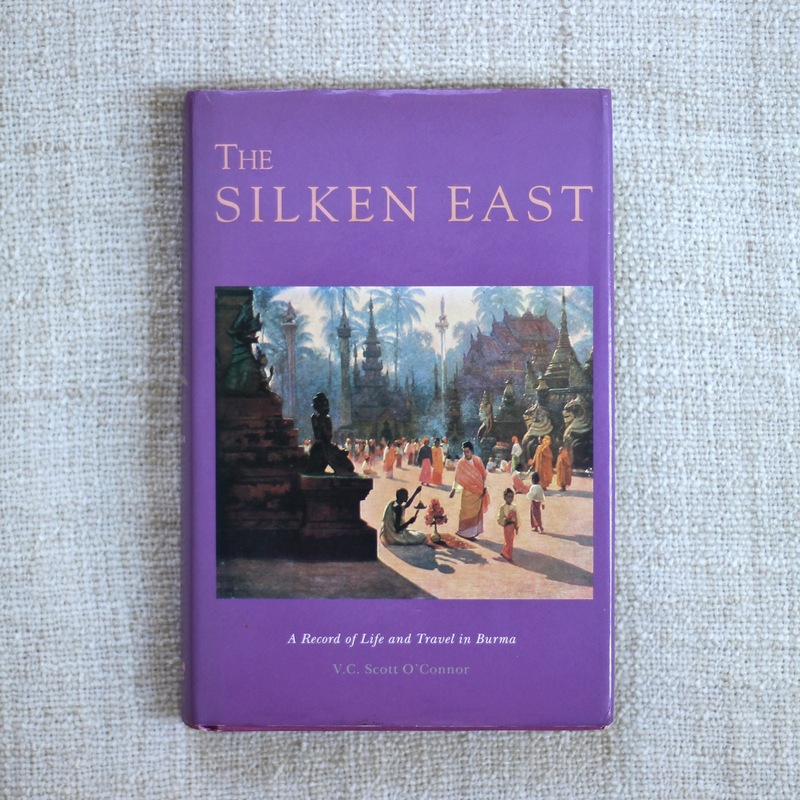 Scott O’Conner’s The Silken East (1904 – reprinted 1993) with paintings by J.R. Middleton. On deck, I just found a nice hardcover of From the Land of Green Ghosts by Pascal Khoo Thwe, and am searching for a used copy of No Time for Dreams by San San Tin, which is proving a little more difficult to locate for a good price. Thank you all for your continued support of this project! I’m excited to have entered this next stage of production and will keep you updated on the progress as it unfolds. What’s a Few Earthquakes and a Coup d’etat? 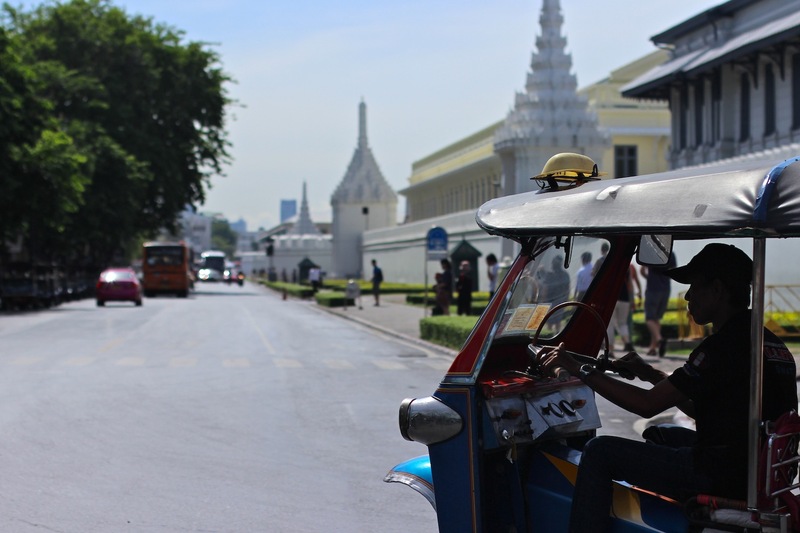 A tuk tuk near the Grand Palace in Bangkok. Thank you to everyone who reached out to me this past week after the Thai military ousted the government in a surprise coup d’etat. For now, all television and radio stations are down (excepting military run channels), there is a nighttime curfew from 10pm-5am, and small street scuffles continue in Bangkok. We shall see what unfolds, but whatever happens next, I hope it is what is best for Thailand. 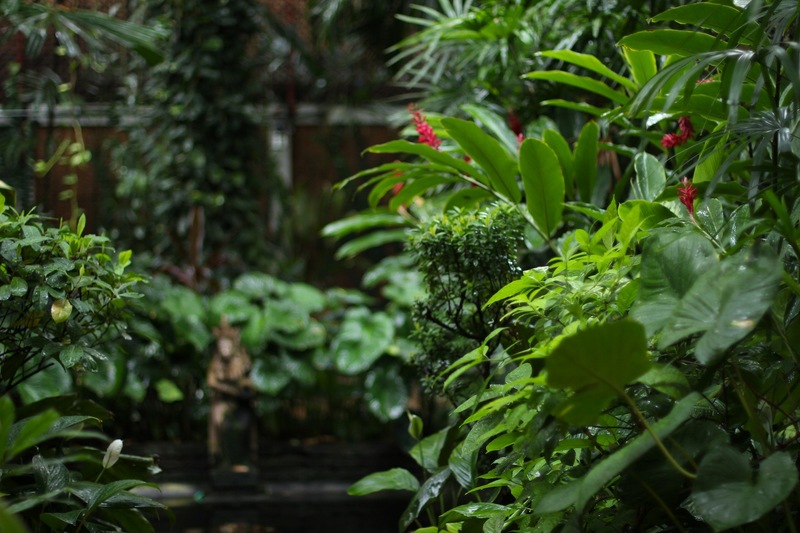 The lush gardens at the Jim Thompson House. 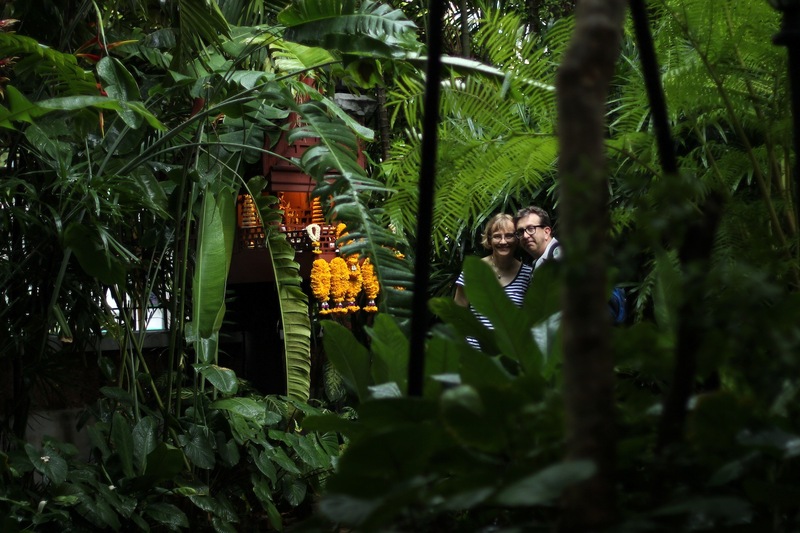 He was Thailand’s silk baron who mysteriously disappeared into the Malaysian jungle in 1967. 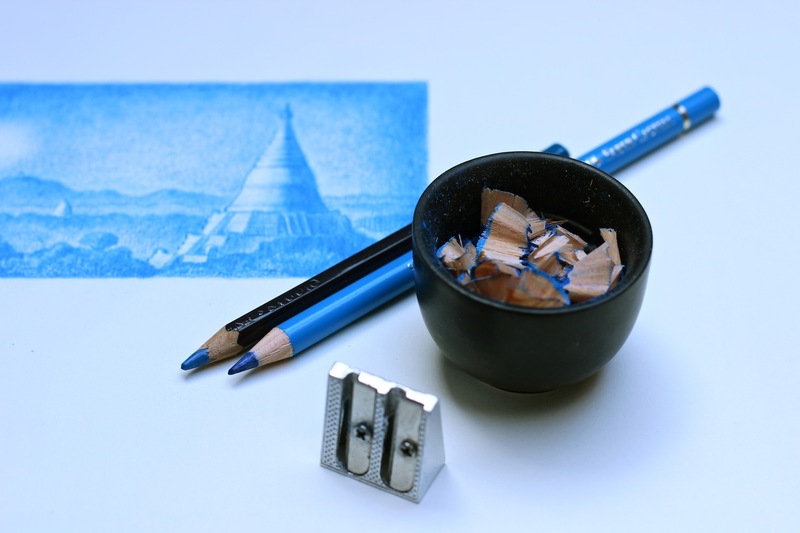 Prints – It’s been a busy few weeks! 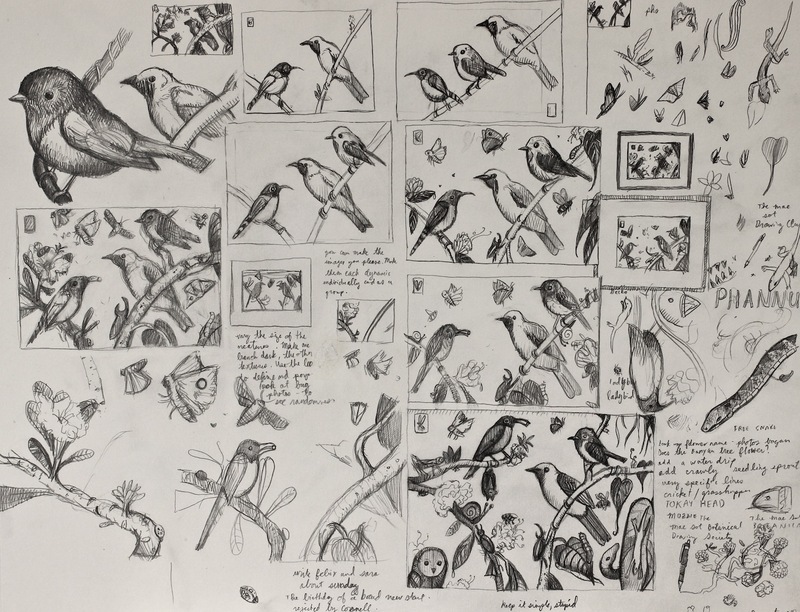 Recently, I moved to Chiang Mai, the second largest city in Thailand, to hunker down and focus on the final print designs for the Flora Fauna project. The work is going really well, and I am currently figuring my way through a particularly tricky drawing depicting the Asian Elephant. Once it is resolved, I’ll be sure to share that image with you! Family – My parents came for a visit and we had a great time touring the country together. It was an important trip so that they will have an understanding of where I have been. Someday we’ll laugh about when they forgot their passports in Mae Sot, and we only realized it on a bus stopped at a military checkpoint leaving town. It is possible they did this just for a little excitement. 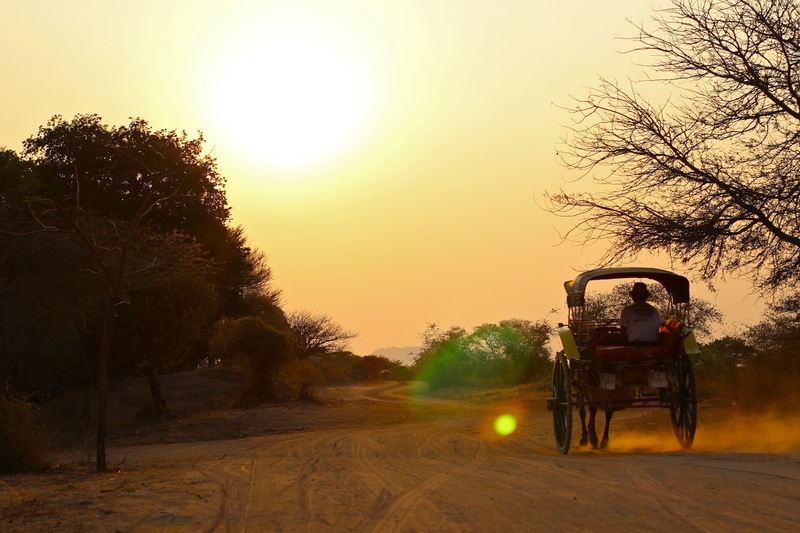 Flora – During our travels, we got to see an array of fascinating plants and animals. As usual, I took a lot of photographs- some of which have already proven to be important visual aides for the remaining print designs. 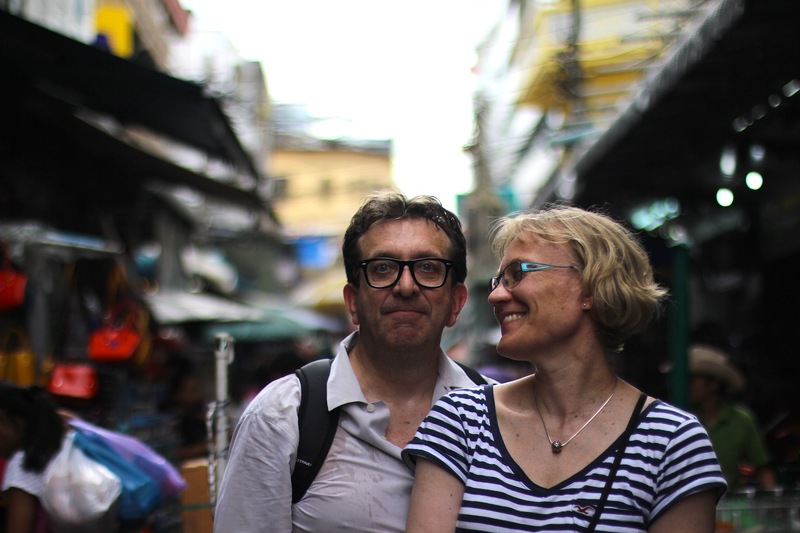 My parents in Yaowarat, Bangkok’s Chinatown. 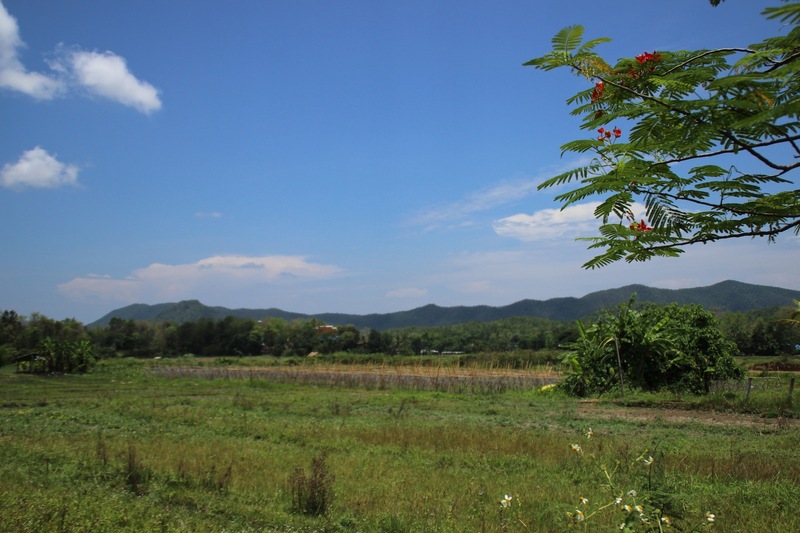 The countryside outside of Chiang Mai. In one week I’m headed to Bangkok to fly out to Portland, OR. I cannot believe how fast my time here has gone! So far, this has been a fulfilling and fruitful experience, and I am excited about the next stage of the project. Back in Portland, I’ll be finishing up the final designs, and preparing the images for the next step. I’ve already been in talks with some dynamic, professional printmakers about the best way to see this project to completion. THANK YOU again for your continued support with my project! Here are a few photographs from recent travels with my family. 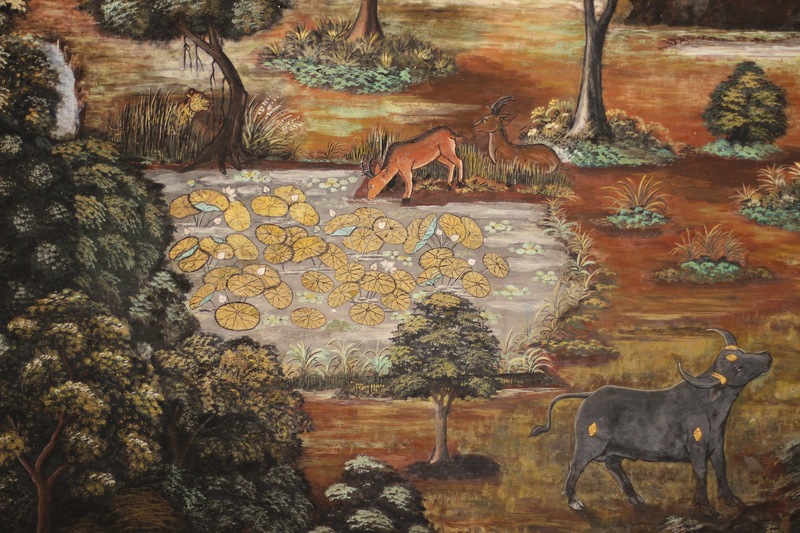 Early flora fauna painting in the extensive murals at Wat Phra Kaew, the temple located at the Grand Palace in Bangkok. 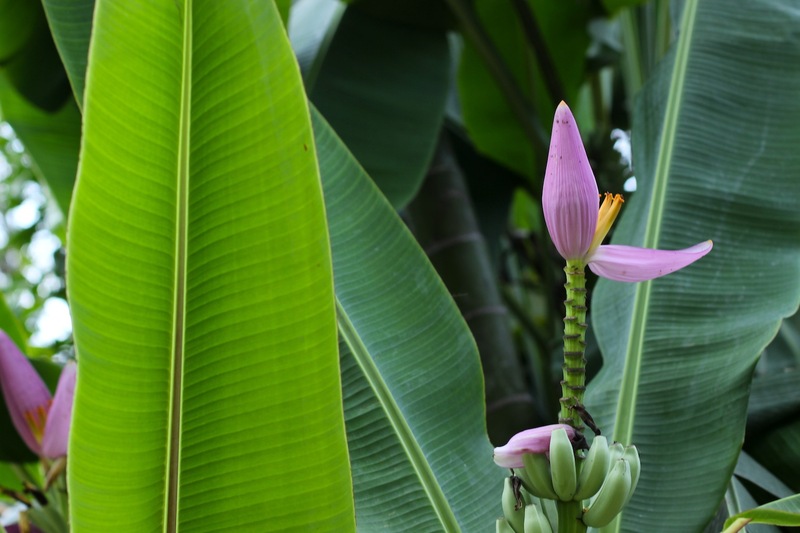 Bananas and flowers in Mae Sa National park, outside of Chiang Mai. 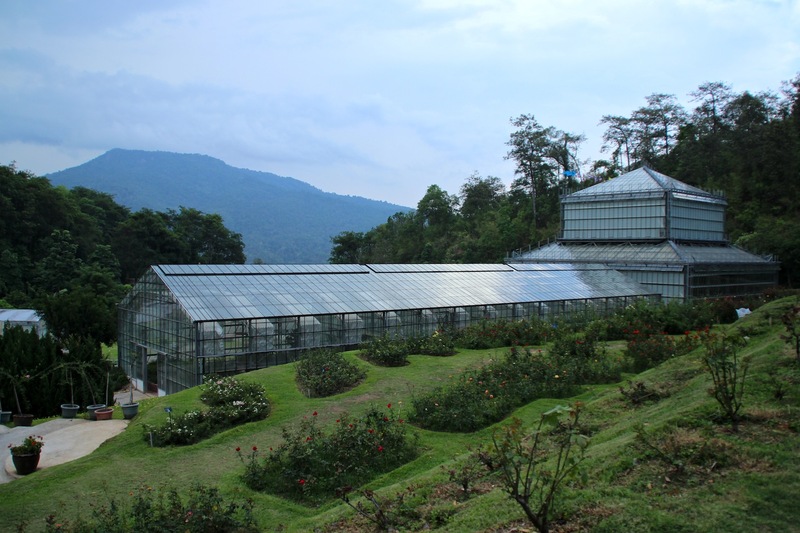 Expansive greenhouses at the Queen Sirikit Botanical Garden, outside of Chiang Mai. 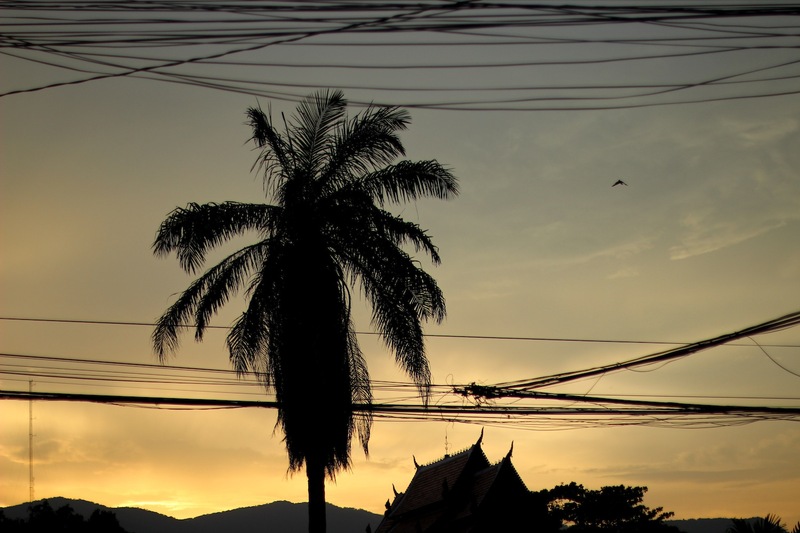 Palms and wires at near Wat Phra Singh in Chiang Mai. 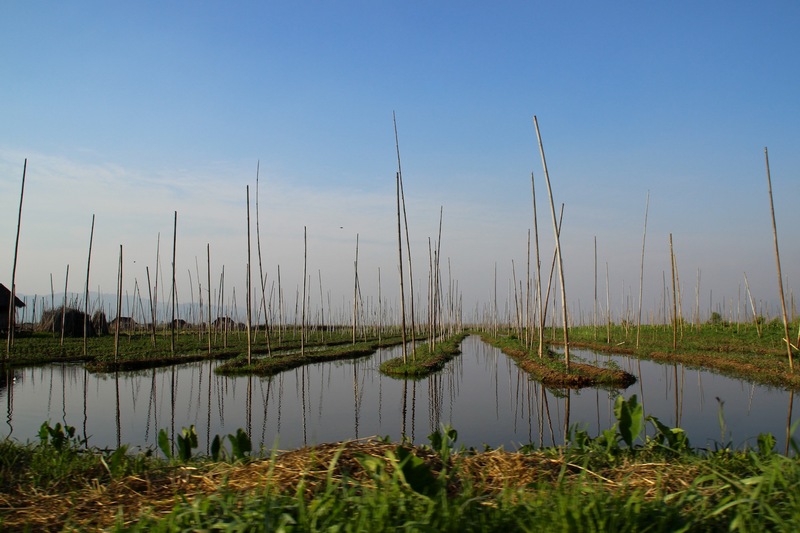 Farmland outside of Chiang Mai, Thailand. The massive Golden Buddha at Wat Traimit. 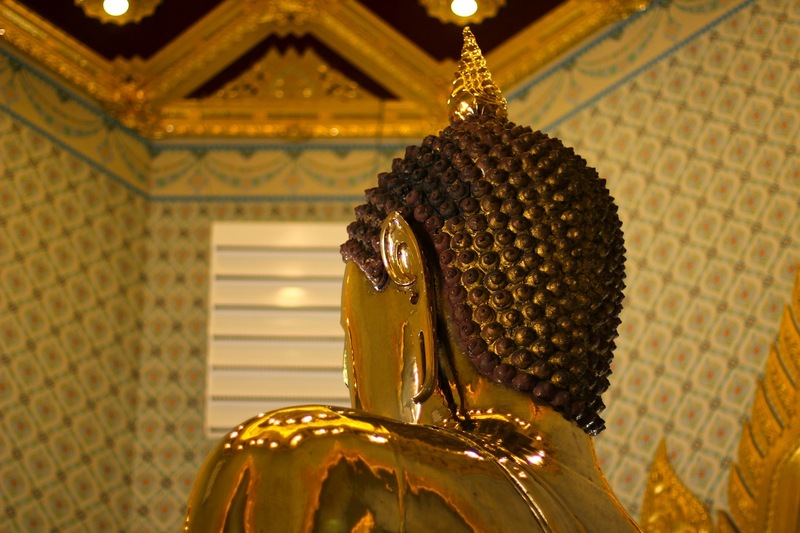 The Golden Buddha at Wat Traimit (aka The Temple of the Golden Buddha) in Bangkok, is said to be the largest solid gold statue in the world (3.9 meters tall, and weighs 5.5 tons). It boasts a fascinating history, and was believed to have been made during the 13-14 century in Sukhothai, the ancient capital of Siam. At some point before the Burmese armies invaded and destroyed the Kingdom of Ayutthaya in 1767*, the golden Buddha was covered in a thick layer of plaster and mosaic glass and therefore hidden in plain sight from the invading army. Thought to be a large statue of little value, it was left untouched in the ruins of Ayutthaya and remained lost for nearly 200 years until it was being moved to a new temple in Bangkok in 1954. While it was being moved the deceptively heavy statue broke the ropes that were being used to hoist it, revealing its true nature underneath the plaster. *An interesting side note that I learned is that much of northern Thailand, including the city of Chiang Mai, once belonged to Burma. 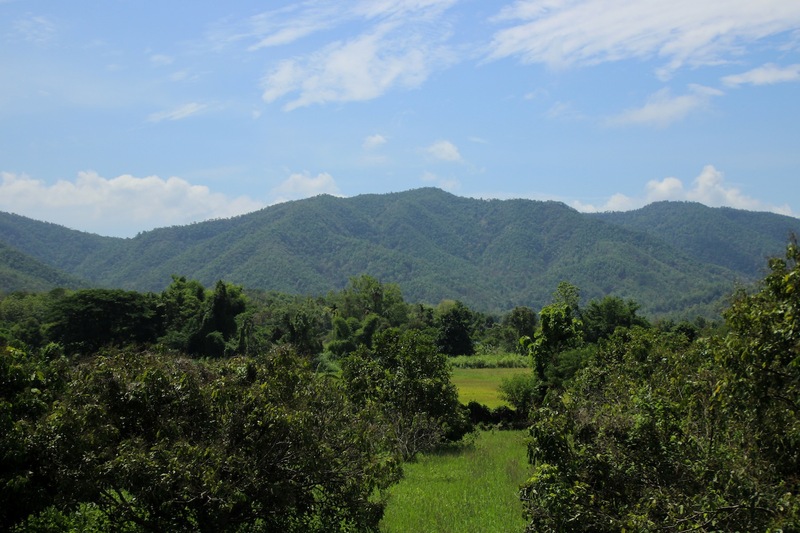 Also, during the invading Burmese army’s retreat in 1767 they marched through the previous incarnation Mae Sot, now located on the Thai-Burma border. The question remains: did they stop at Canadian Dave’s restaurant? Also, I was told by a Thai friend that ancient Thailand used to boast an abundance of gold, much of which was looted by the invading Burmese Army. The gold cache was then taken back to Burma only to be liberated by the Colonial British while Burma was part of the British Raj or British India. 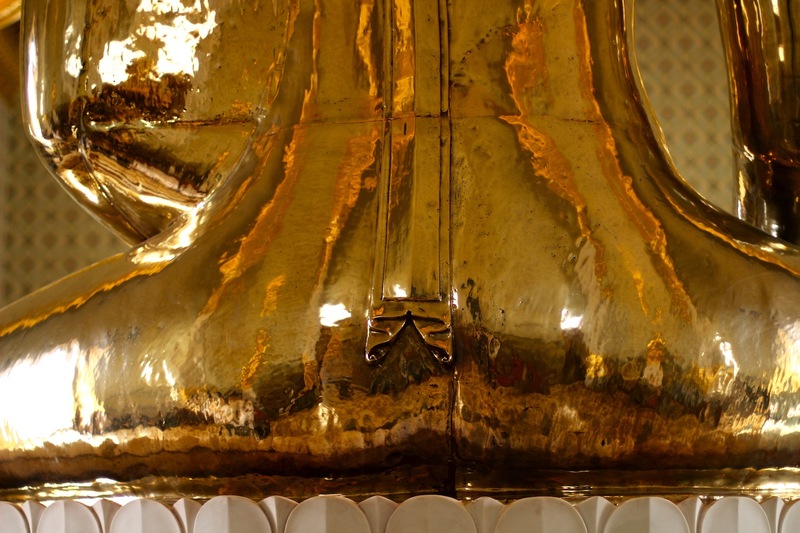 This photo of the backside of the Golden Buddha illustrates the seams where the nine perfectly interlocking pieces that make the statue fit together. 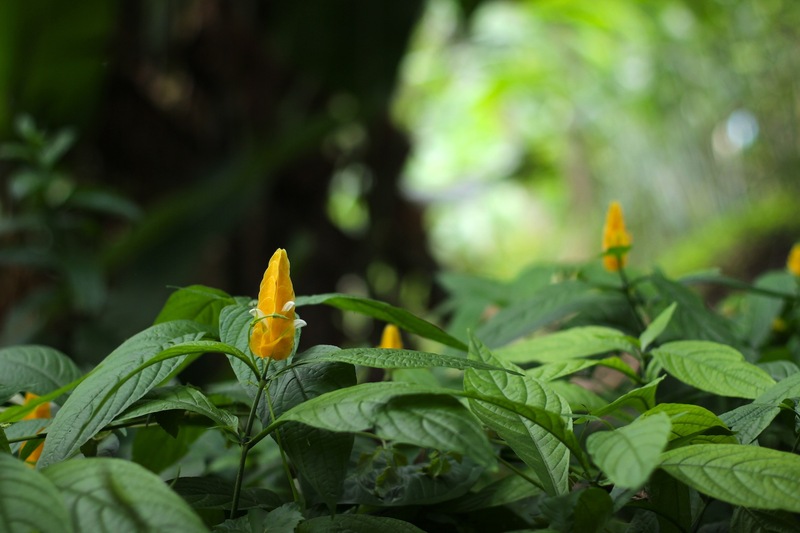 Flowers in Mae Sa National park, outside of Chiang Mai. During a brief, final workshop student SKP drew a cute “lady lion”. The assignment was to focus on mammals in movement, and I loved this drawing in particular. 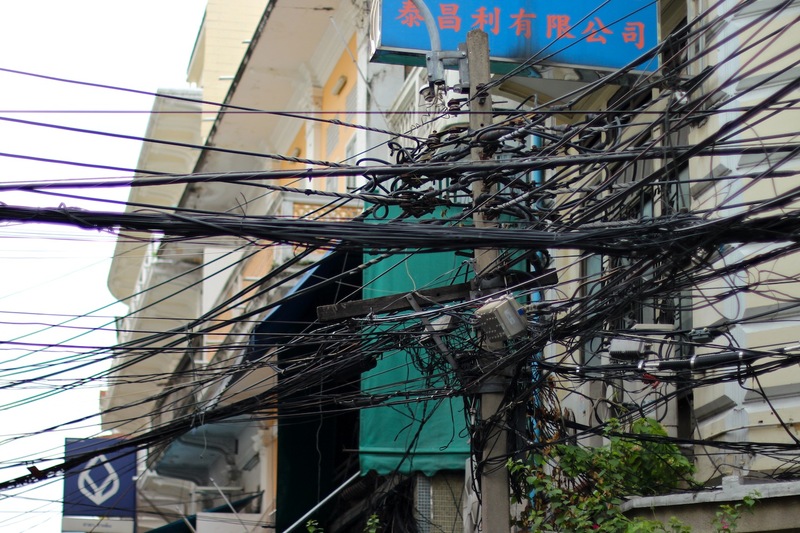 Thailand is known for many things, but not for the removal of defunct wires. 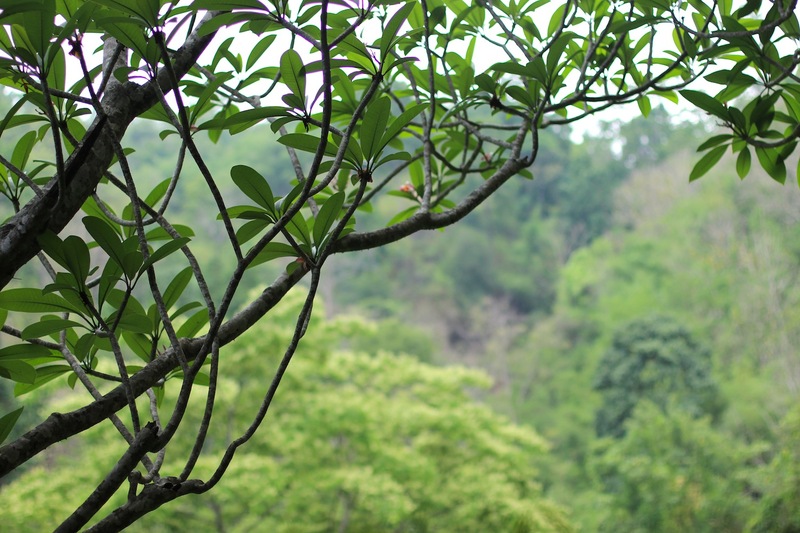 Flowering trees in Mae Sa National Forest. Student PD working on his piece during a flora fauna workshop at Kick-Start ART. 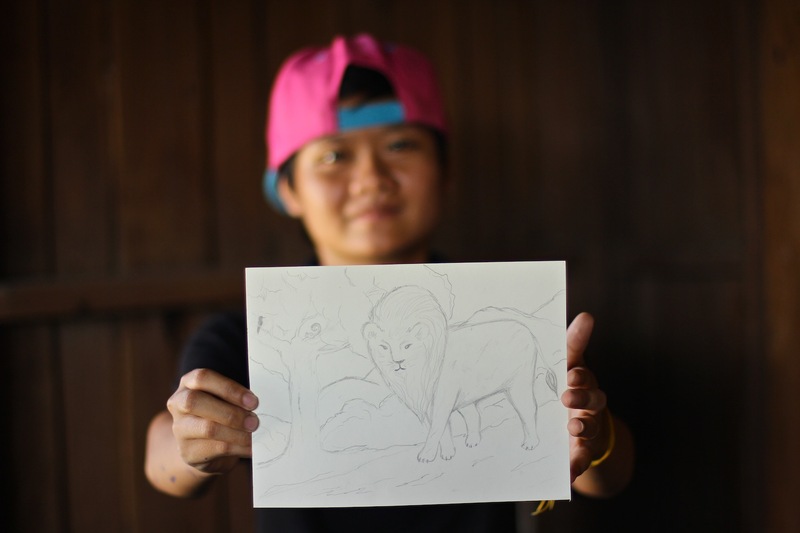 One of the groups I taught drawing workshops with in Mae Sot is Kick-Start ART. I was happy to see they are closing in on their recent fundraising endeavors. The people who run Kick-Start ART are incredible, enthusiastic, and motivated group. They did everything they could to make my involvement as a volunteer teacher a positive experience. 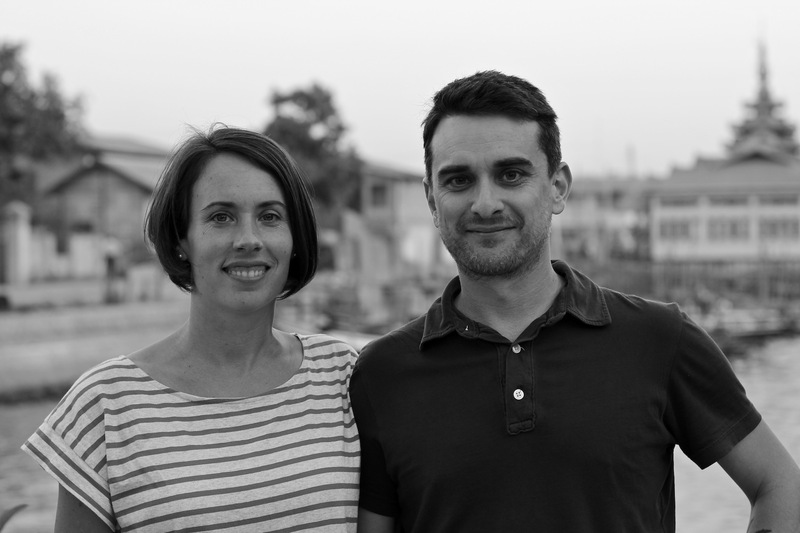 Check out their fantastic video to get a glimpse of what they provide and the situation that many of the migrant Burmese students are coming from. The teachers in the video were some of my favorite students, and were such a joy to work with! A rare glimpse of parents in the wild. 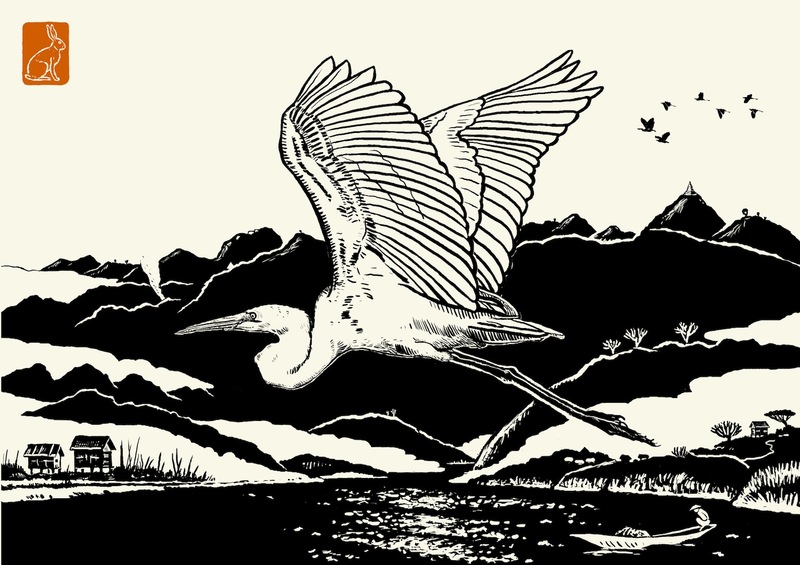 The Print – This print design features the Great Eastern Egret flying over Inle Lake (pronounced in-lay), located in Upper Burma. It is the last print to focus on a flying creature as a main character, and I’m already busy at work on the final four designs that star some pretty stellar and unique mammals. 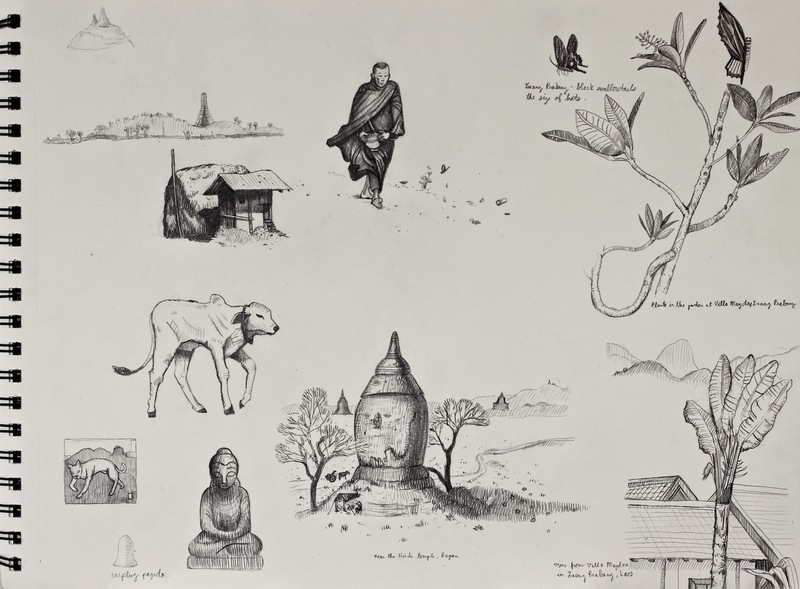 The Characters – Inspired directly by my own experience, this design was cobbled together from my sketches, photographs, and memories of Inle Lake. 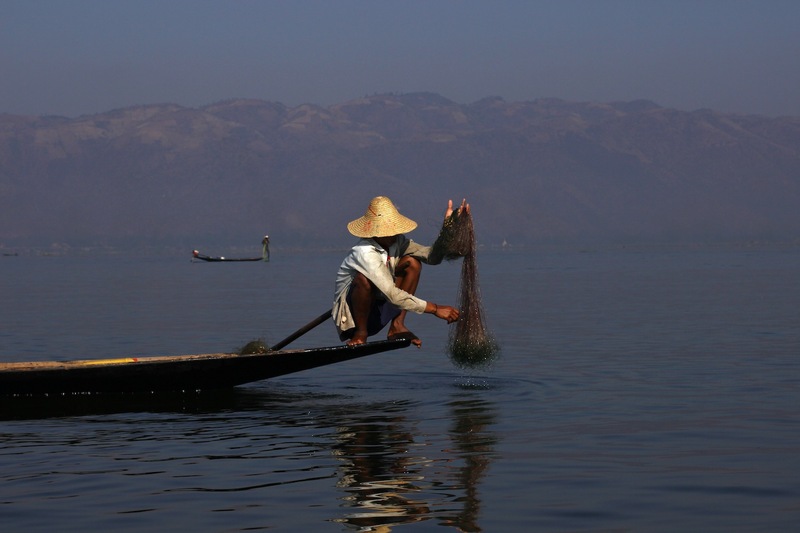 The elements include a fisherman on his wooden boat, smoke rising from a burning fire high upon the mountain (upper left), fog and mist rolling between the mountains, a flock of egrets in the sky, fisherman and farmers’ houses on stilts among the floating gardens of Inle Lake, and a mountaintop monastery. 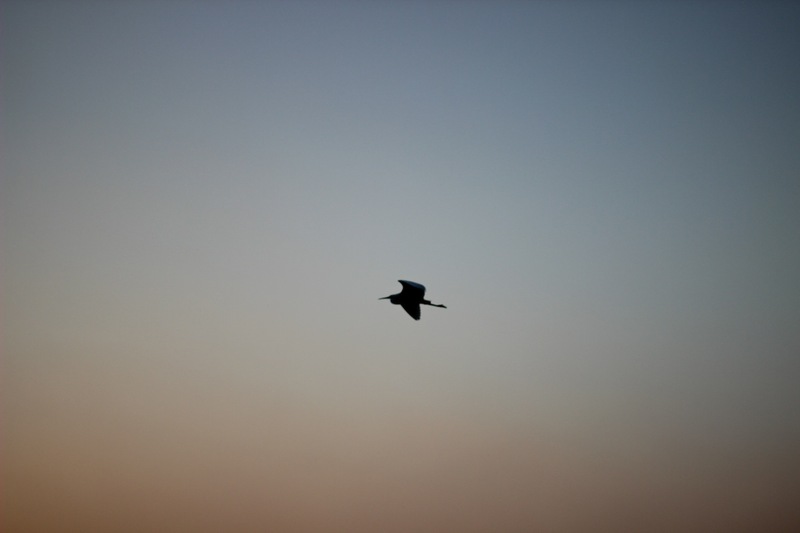 Why an egret? – While varieties of egrets can be a common sight in the US (often seen along the coastlines of Oregon and California) I was struck by the elegance and majesty of these birds against the idyllic backdrop of Inle Lake. It’s no wonder herons have been a staple character in the canon of Japanese printmaking… The sight made an impression on me, and I felt that it was something that I wanted to remember and honor. Egrets and Herons, Storks and Cranes – What’s the difference? 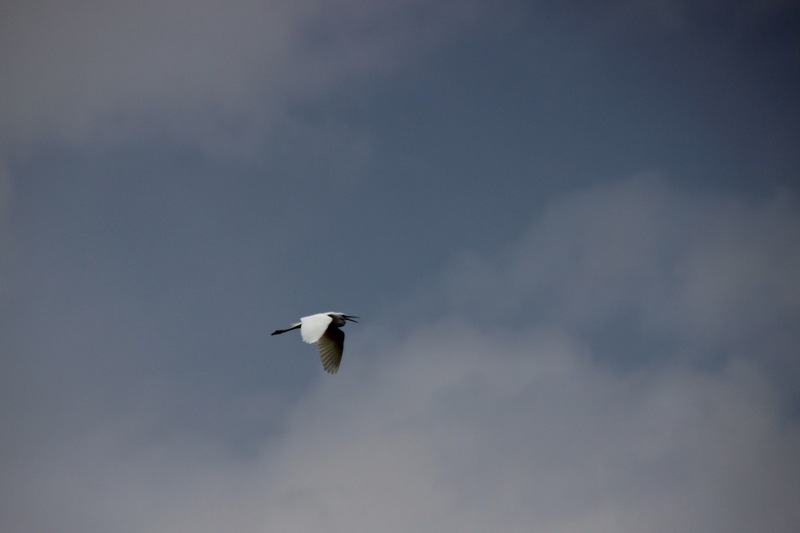 – From what I have read, egrets are essentially a type of heron, but are in a different family from cranes and storks. They are smaller, more svelte, and fly with their heads in a “S” shape, rather than straight outwards like a crane. Egrets were once nearly hunted to extinction for their beautiful plumes, but the species has made a comeback. Seagull attack or pleasure ride? Local Burmese folks feeding a frenzied flock of seagulls to pass the time. Look closely and you can see the food being tossed up to the gull. Hiroshige – This design was surprisingly challenging. 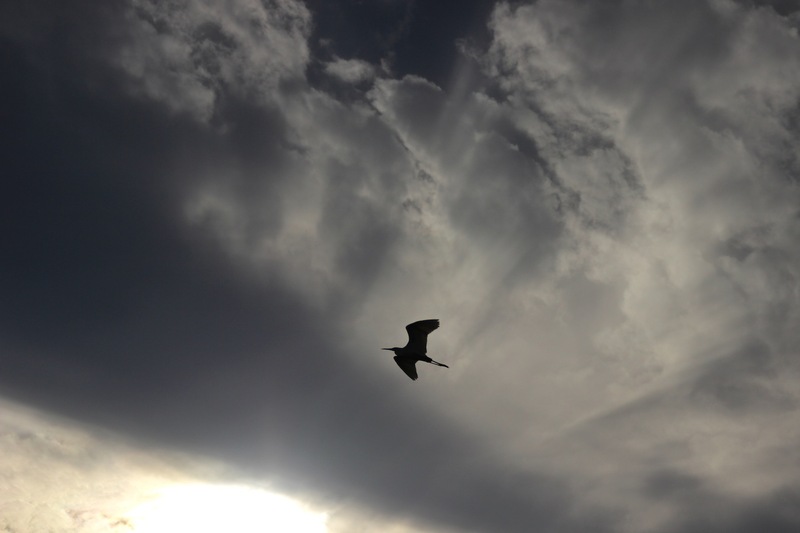 I had hoped for a simple image of an egret set against light, cascading hills. However, it just wasn’t quite striking enough from across the room. So, I made upwards of forty (yes, forty) variations of this design to get it to feel just right, and finally settled on a dusk / dawn image with the hills in silhouette. The variety of flowering tree that I found in Bagan had the same leaf and trunk structure as Plumeria, but the flowers were softer, resembling Hibiscus. She is Thailand’s leading expert on insects. 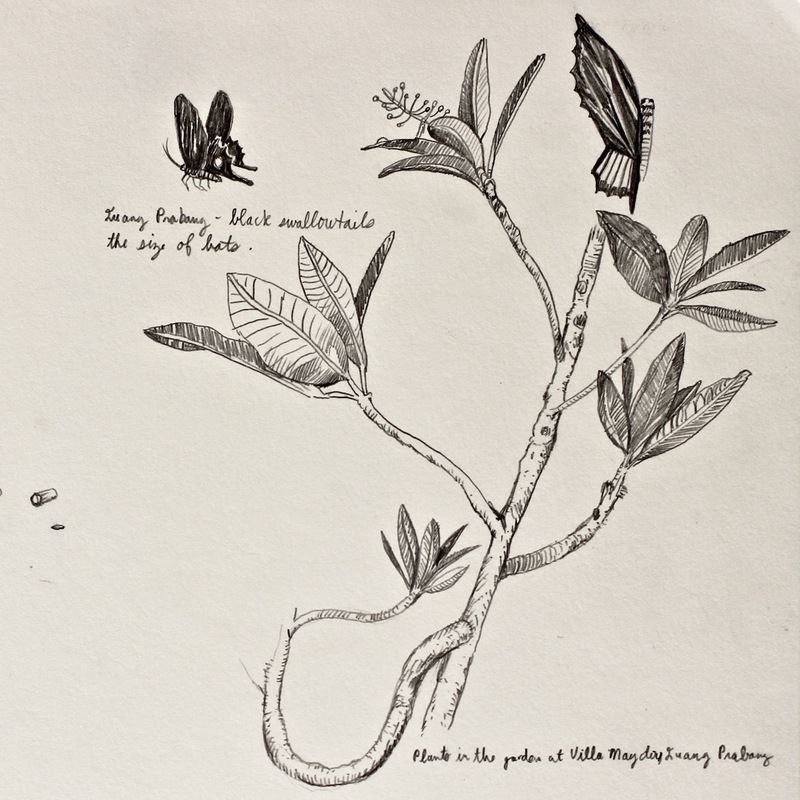 Since the 1950’s she and her husband have dedicated their lives to insects, and specifically, the mosquito, in an effort to understand and eradicate malaria. 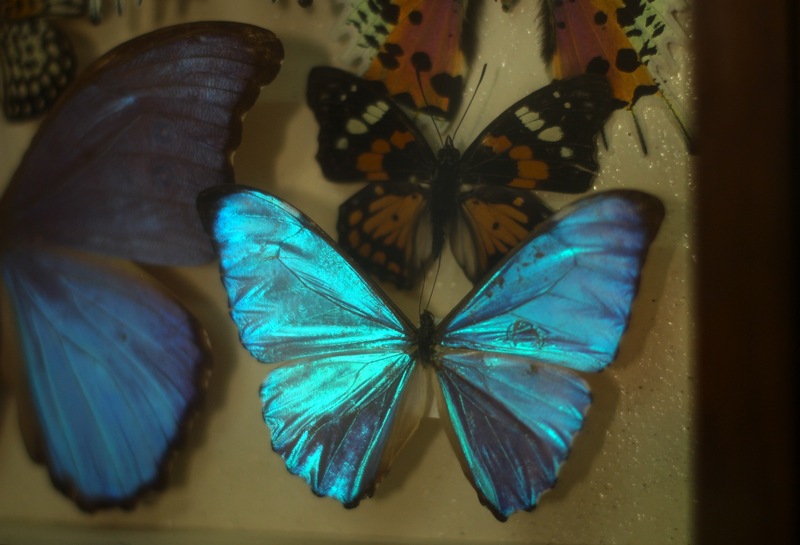 They have researched insects all around the world, and spent years working for the Smithsonian in Washington DC. We had a very pleasant conversation about her life and work and, of course, insects. Dr. Rampa asked about my work- so I shared about my print project and showed her some of the designs. She then offered that I could come back to do some drawing from life in the museum, which I will happily be doing that later this week. 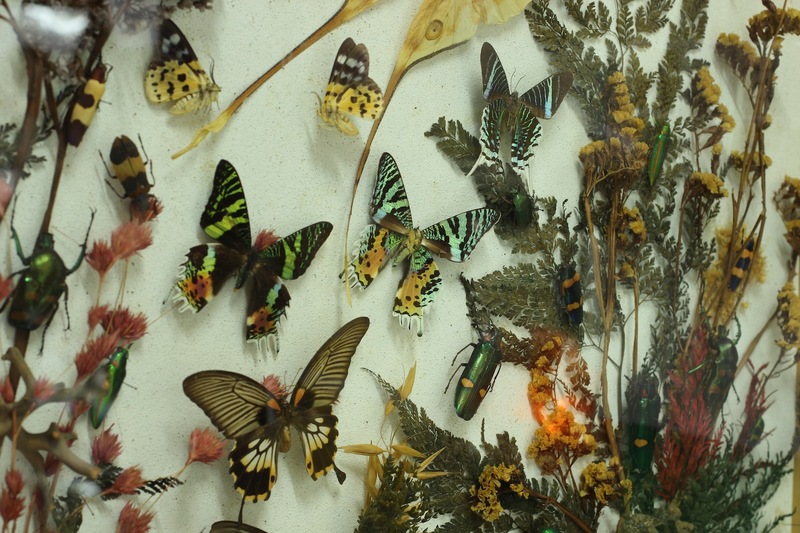 All of the insect photos shown here are from today’s visit. 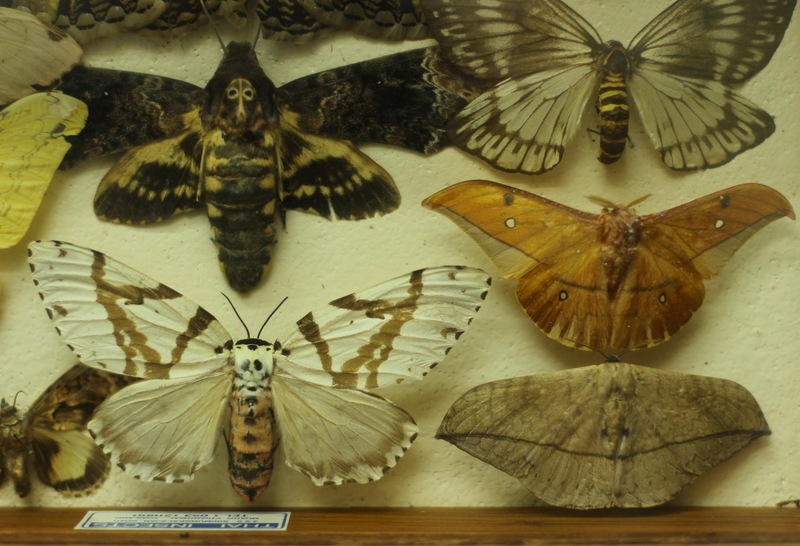 Geometer moth (bottom left corner) and two moths with skull patterns on their backs. Thank you again for all of your support with my project! 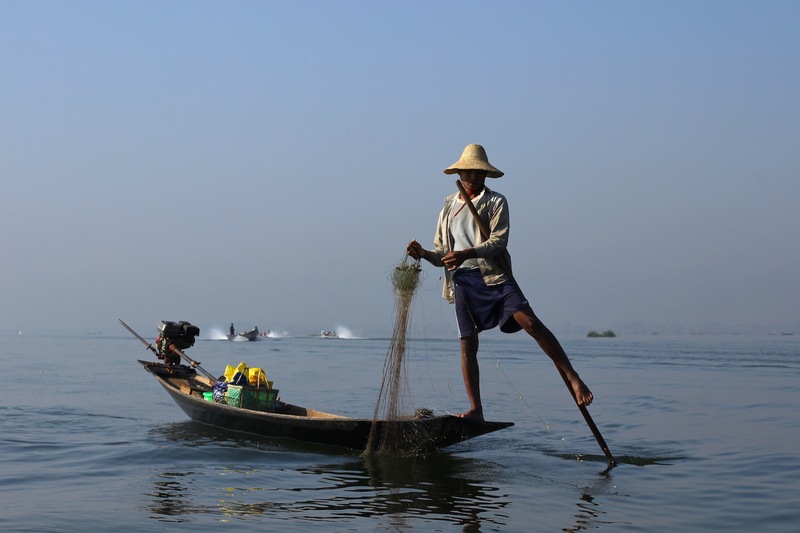 This week I’d like to share more images from our travels through upper Burma. 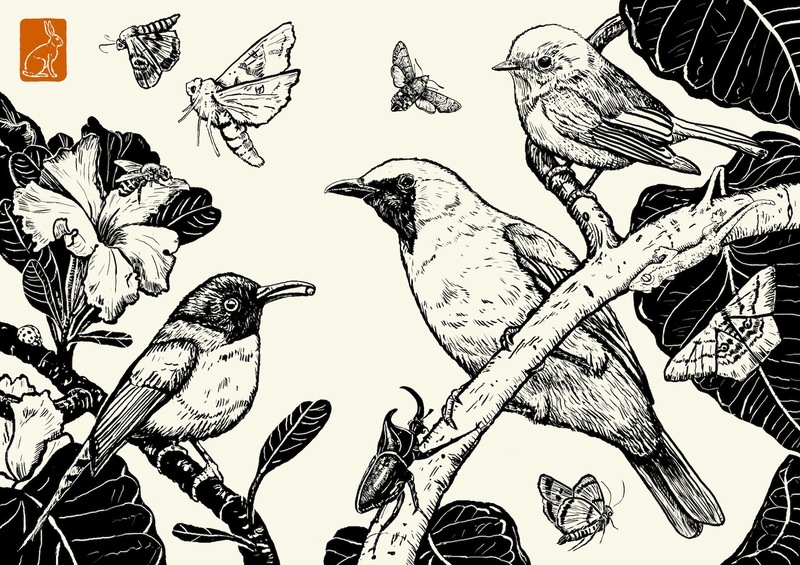 I’m adding the finishing touches to the third print design for the Thailand Burma Flora Fauna series which I am excited to share with you all next week! 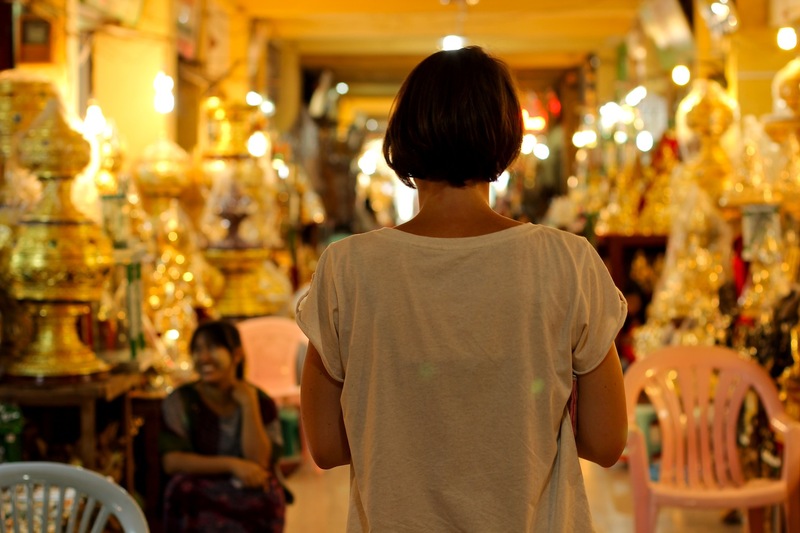 Walking through a gauntlet of golden stalls selling crafts at a large temple in Mandalay. 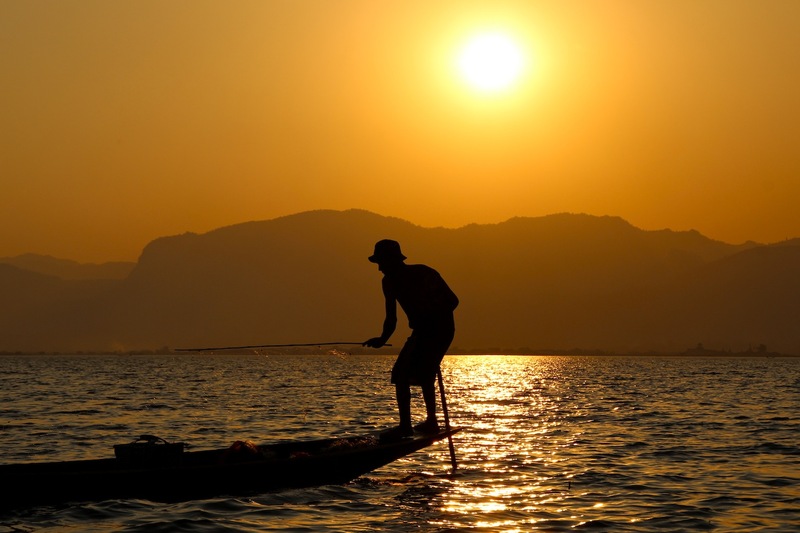 On Inle lake, a fisherman deftly uses his leg to paddle his wooden boat, freeing up his hands to cast and pull in his fishing nets. 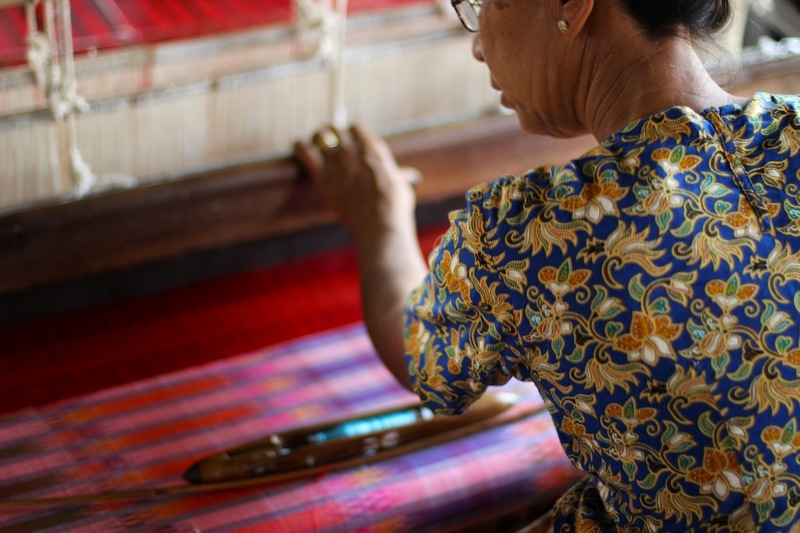 A weaver uses lotus thread, cotton, and silk (thread all handmade in their shop) to operate a foot pedaled wooden loom to make beautiful, intricate longyis (traditional Burmese attire). Sun protection! 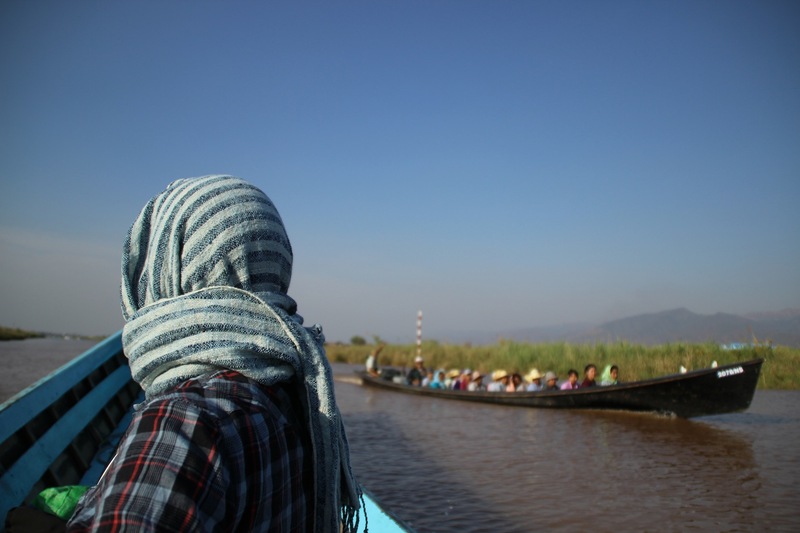 After seeing hordes of bleary eyed, sun burned and lobster-like tourist staggering about Nyuang Shwe, we wrapped ourselves up while out on Inle Lake. 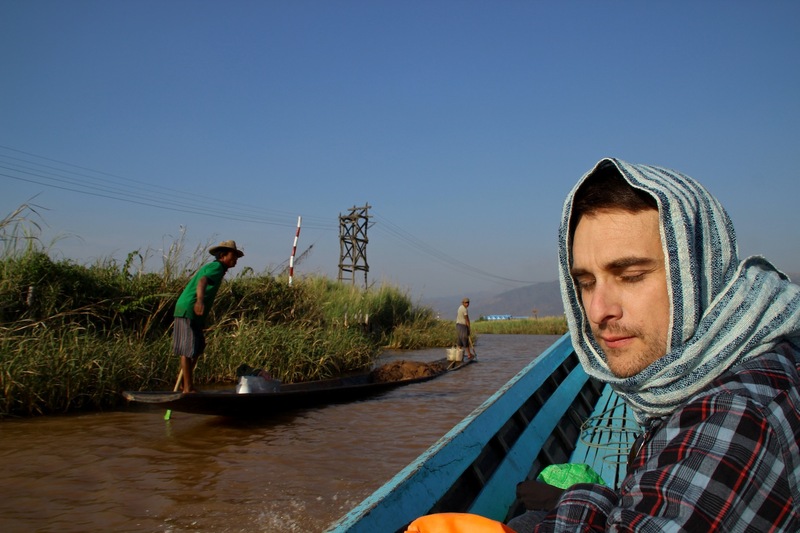 Down endless green canals, we passed the “floating gardens” of Inle Lake. At one point, at the insistence of our driver, I climbed out of our longboat and walked on a patch of spongy, plant entangled earth. Beneath each foot I immediately (but slowly) began sink into the lake- what an odd sensation! 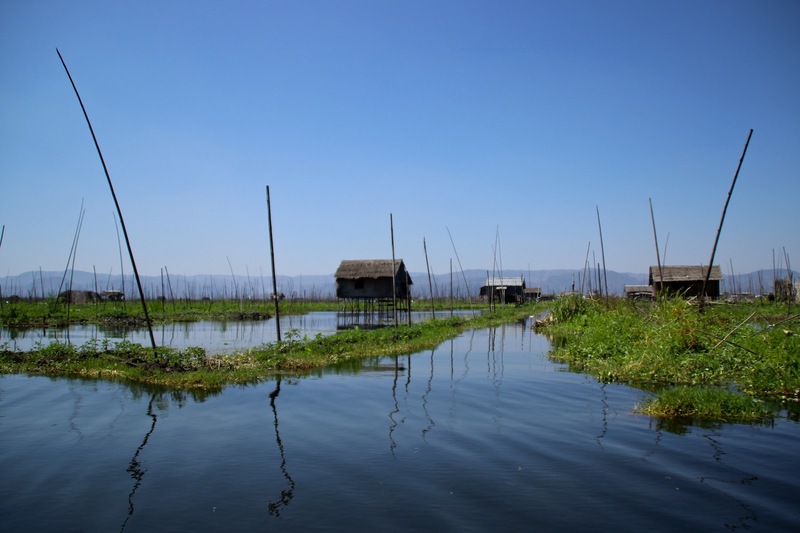 In the photo above you can see one of the thatched bamboo houses, up on stilts, in which the local farmers live and work. 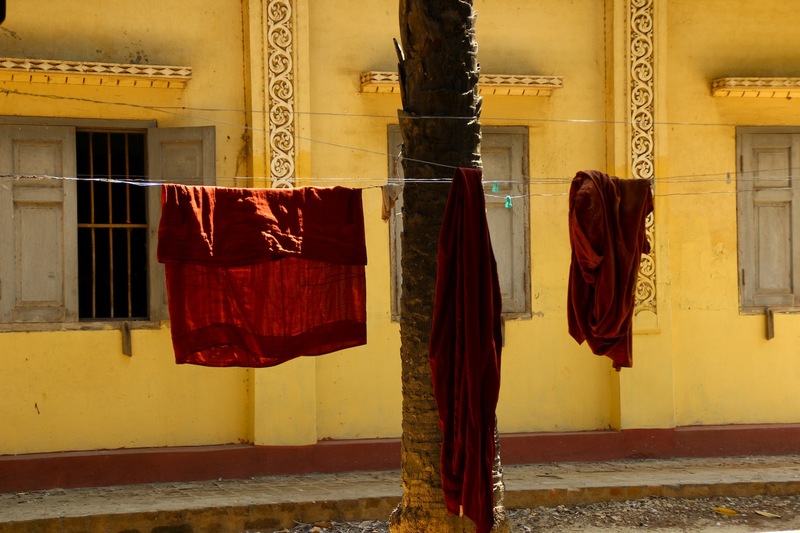 At an old temple in Mandalay, monks hang up their laundry to dry in the morning sun. 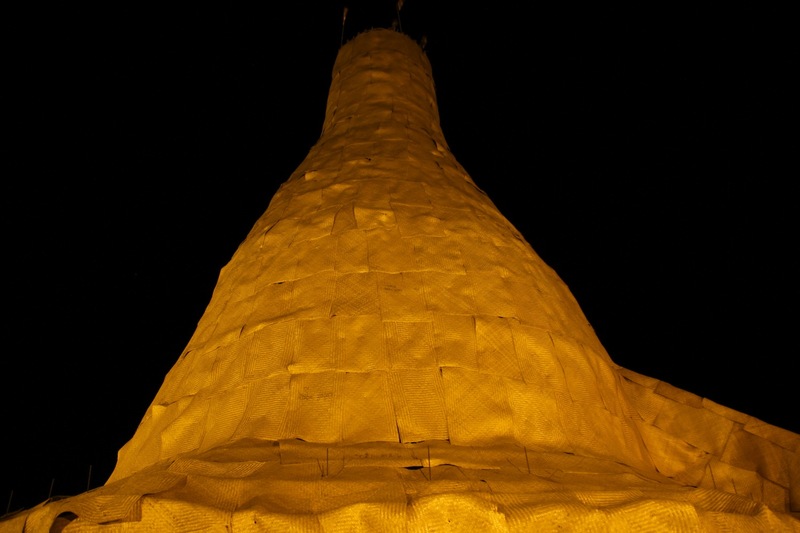 A tall mountain top pagoda is covered in woven mats while it is gold leafed and restored. 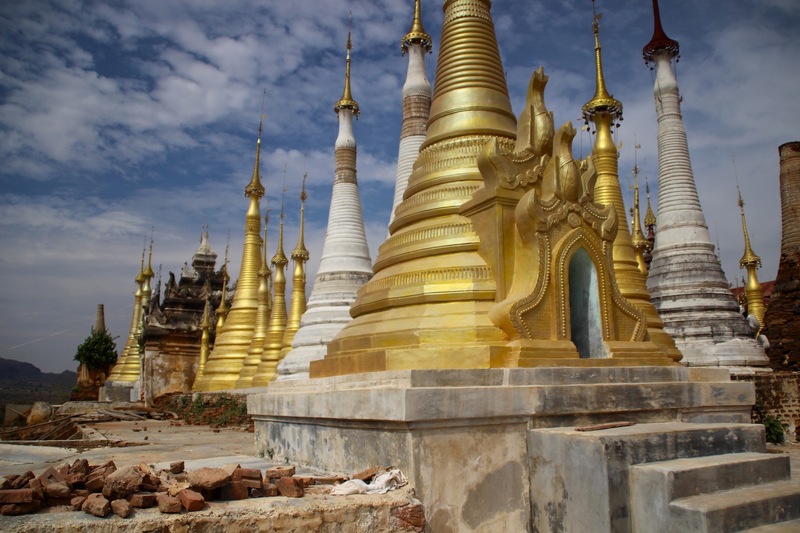 One of my favorite moments from Upper Burma was an unexpected visit to a mountaintop pagoda along the road to Bagan. This pagoda is currently being restored and re-gold leafed, so it is covered in a bamboo scaffolding, which was then sheathed in woven mats from top to bottom. We arrived there in the dark of night after all of the stalls had shut down except for two women selling garlands of white flowers. In our bare feet we padded up a long, worn, stone staircase to the summit– up past families noiselessly eating dinner around circular tables. Sleepy cats lazing on wooden window sills. A monk who sat in his abode and stared blankly at us with even keeled indifference. Atop the hill was an immense silence under a black starry sky. We could see the vast rolling plain from which we came, and Mt. 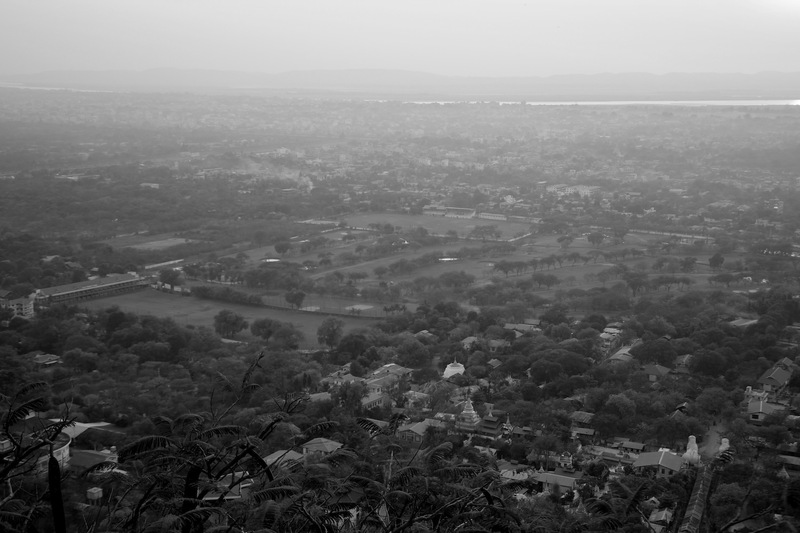 Popa on the horizon– small plumes of smoke rising about the valley. The crescent moon behind foggy distant clouds. The quiet was punctuated only by the occasional flapping of prayer flags atop the pagoda, and the nearly inaudible murmuring of a woman who was intensely praying and gently rocking back and forth in front of a small statue of the Buddha. It is only a projection, but I got the feeling like she was working her way through a personal crisis, up here alone at night and completely unaware of our presence. It was nice moment, and a good memory– something I’ll never forget. Below is an illustration from my travel sketchbook of the woman praying. 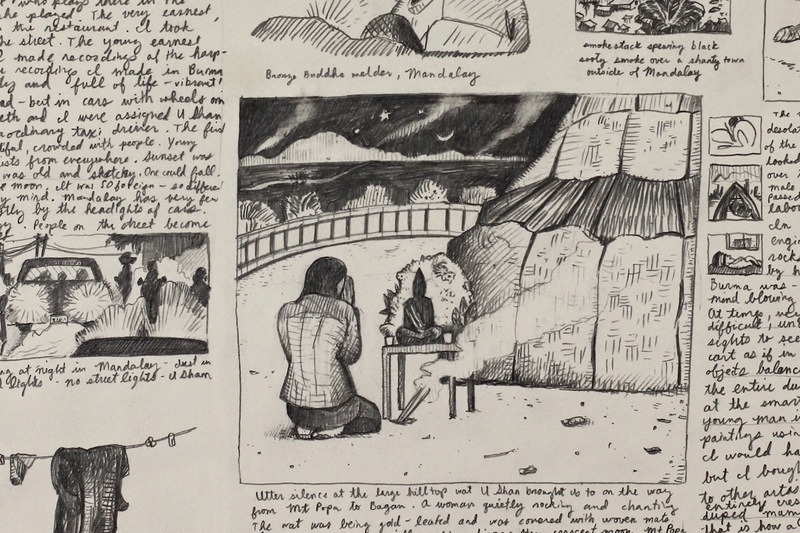 Travel sketchbook – In the quiet of night a woman prays at a mountaintop pagoda. Men hammering gold leaf in Mandalay. Making authentic gold leaf by hand takes a tremendous amount of time and human energy! The hammers alone are very heavy, so the men brace themselves against wooden rests behind them and spend their days hunched over flattening out small packets into leaf (while somehow not hammering their feet which barely straddle the wrapped gold). I did purchase gold leaf from this shop with the possibility of using it to sign the first edition of prints in this series. Maybe– we’ll see how it looks at that stage. Mt. Popa boasts a jutting spire of rock with large monastery atop the mountain. You can also see some of the burning fields / forests that are adding to SE Asia’s current air pollution crisis. 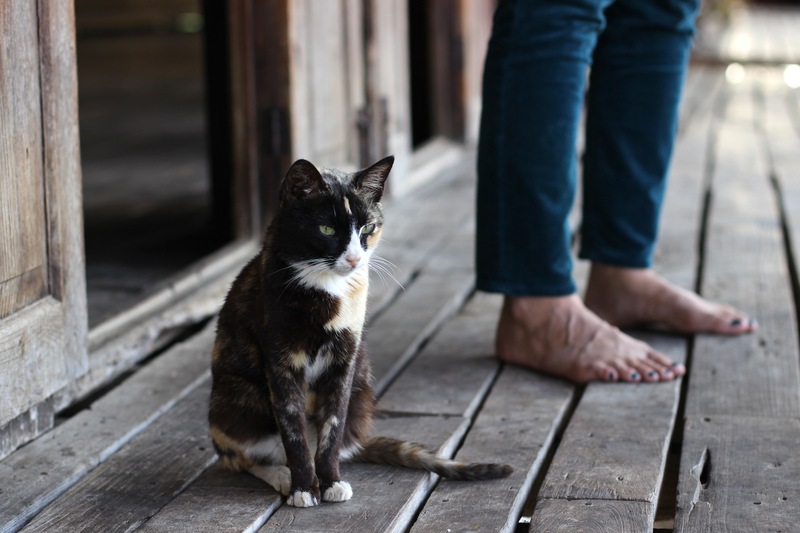 A cat with Beth’s feet at Jumping Cat Monastery, Inle Lake. In the recent past, Jumping Cat Monastery on Inle Lake was a place where Buddhist monks trained cats to do an assortment of tricks, like jumping through hoops. Unfortunately, tourists began showing up and asking / demanding that the monks make the cats perform for them. As you might expect, performing for tourists isn’t very monk-like, so they have since discontinued the practice. Nowadays, monk and cat simply live together at the monastery. Clearly you can see in this cat’s eyes that she is not interested in performing for us, but she could if she wanted to. 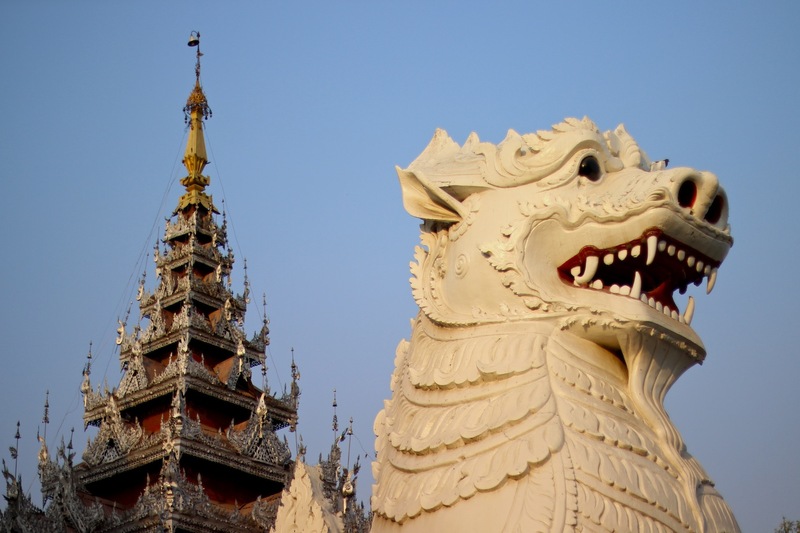 One of two enormous white lions standing guard at the entrance to the stairway up Mandalay Hill. 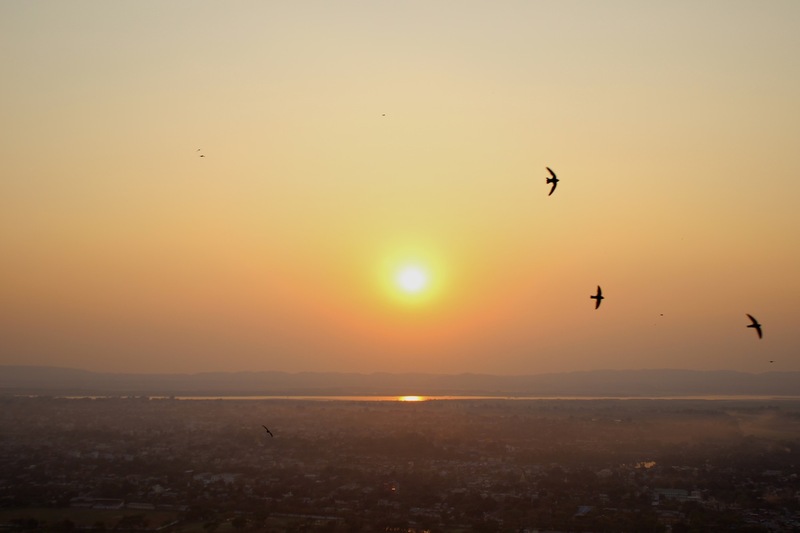 Swallows and sunset over Mandalay from Mandalay Hill. Thank you for reading and for your continued support with my project! 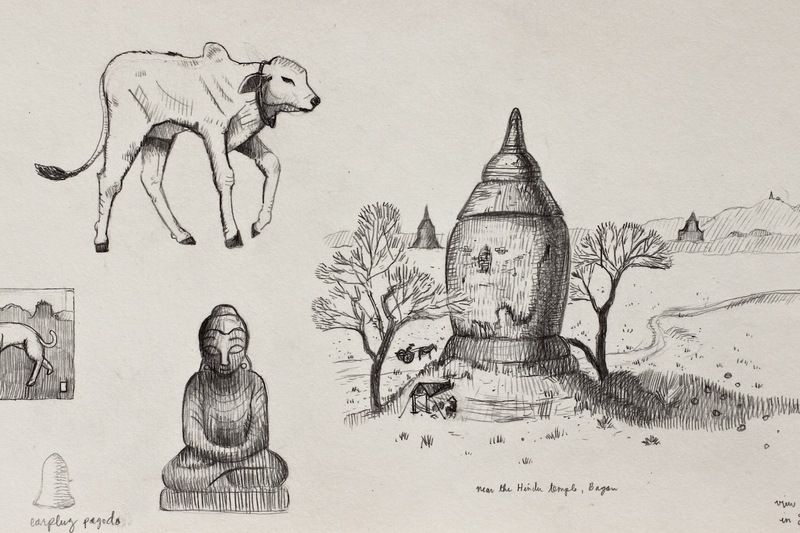 Bagan sketchbook detail of a banteng calf and an ancient pagoda. 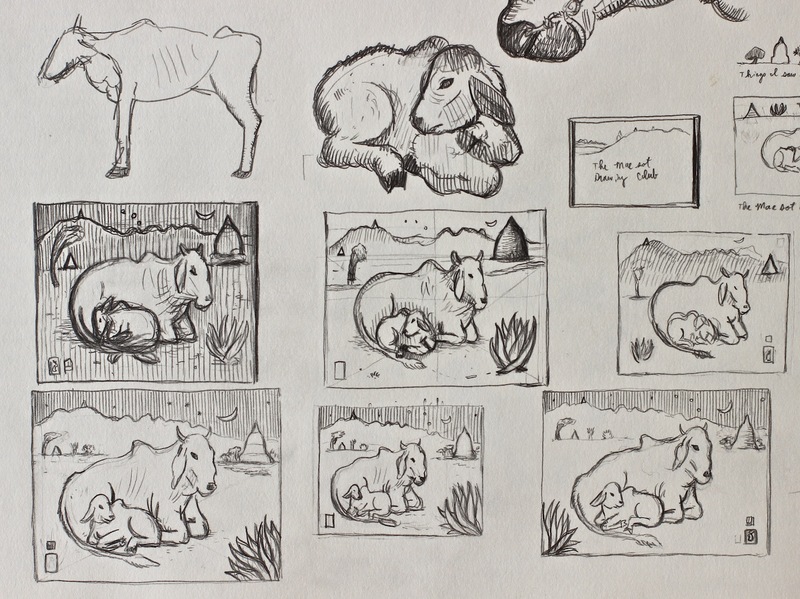 Working out variations of the composition using thumbnail drawings. 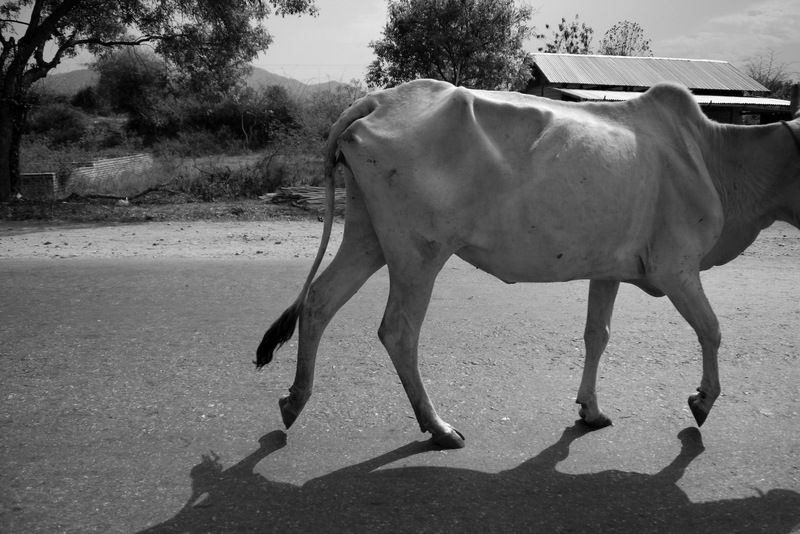 Why choose something as mundane as cattle? 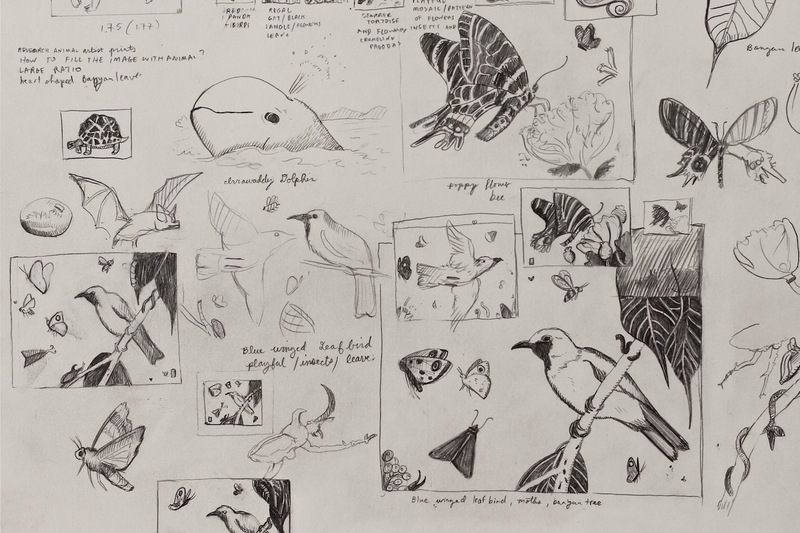 One – As part of my rubric for the series, I determined that it would be too predictable to only represent animals that were exotic or endangered species. 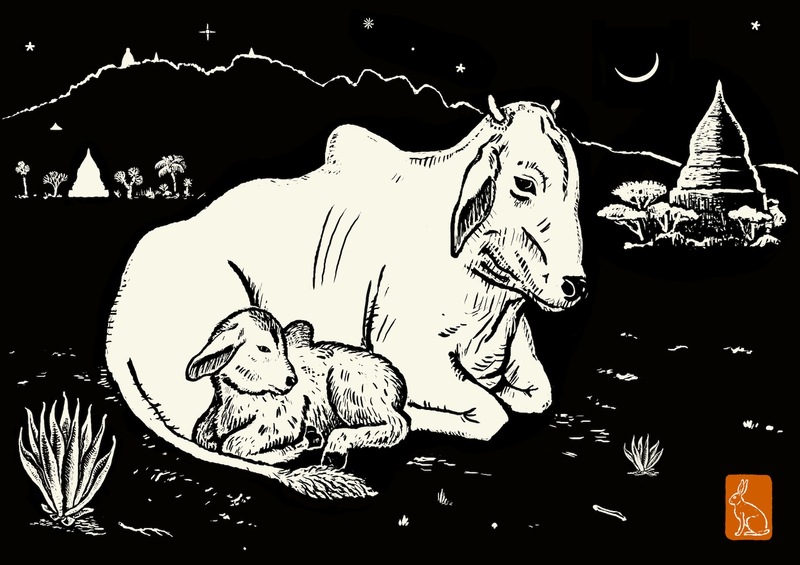 I wanted some animals that were thriving, and at least one type that lived among human beings. Like the elephant, cattle have had a complex role in the development of civilization over several millennia, and I wanted to honor that role. 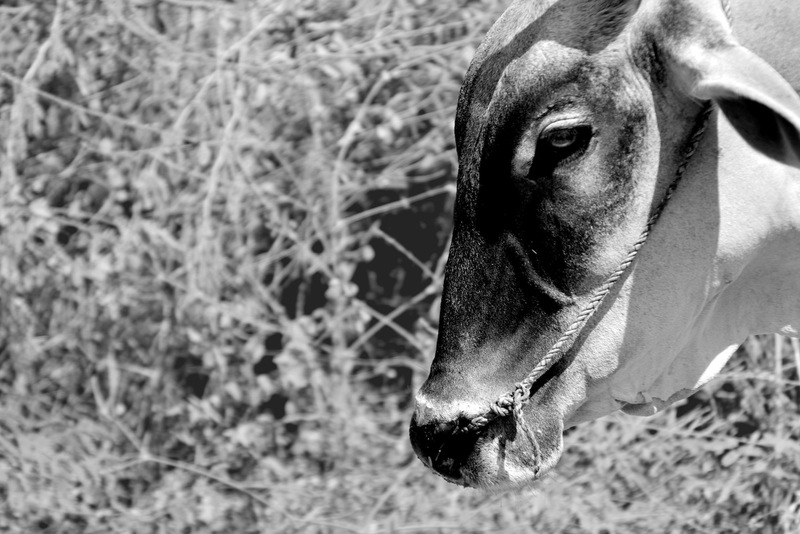 Two – Banteng, or tembadau, are one of the animals that really stood out to me while I was in Burma. We saw so many different breeds being herded among the ruins in Bagan. Some were wilder looking varieties– buff colored oxen with wavy viking-like horns. But I found that the Bali cattle (domesticated banteng) were the most visually striking with their humps, floppy ears, and large, peaceful doe eyes. Here’s looking at you, cow. 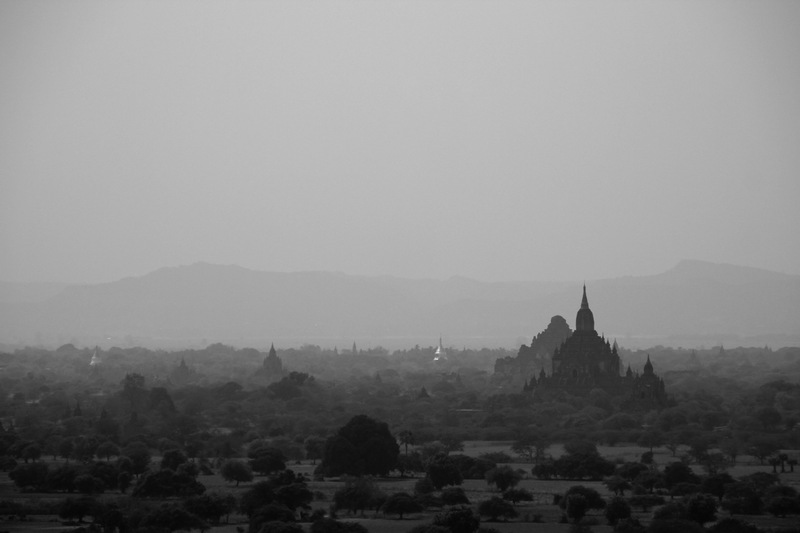 Bagan was easily one of the most incredible places I have ever been, and I was surprised at how arid upper Burma is. Think: dusty red earth, dry stream beds, and a thriving variety of plants and trees acclimated to a desert climate. In the image, I included toddy palms, eucalyptus, and acacia trees, as well as cactus and aloe vera plants among the ruins of the temples. Also, while we were in Bagan the Orion constellation was prominent in the night time sky, and the crescent moon would lay flat on its back in a way that appeared unusual to me. I wanted to remember these details so I included them in the print design. A temple in Bagan, early sunset hours. 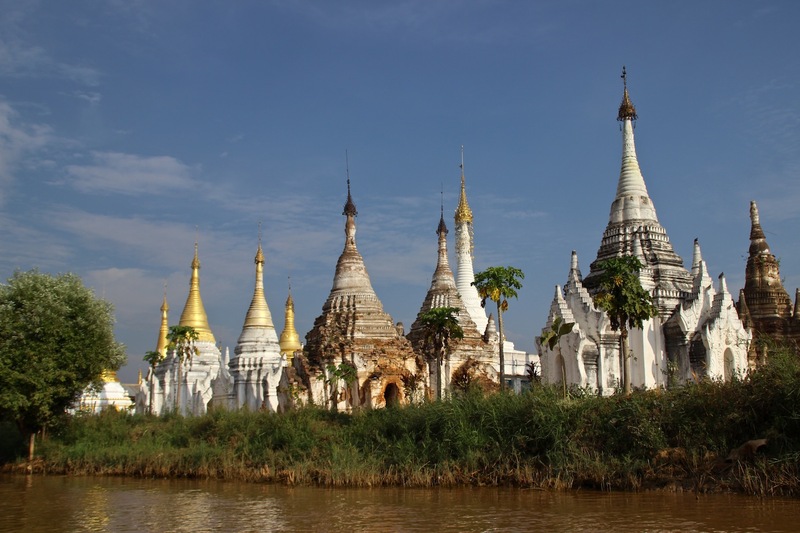 Bagan – Bagan was the ancient capital city of what would later become Burma. Between the 11th and 13th century thousands of temples, monasteries and stupas were constructed there, of which there are still over 2,200 pagodas left today. 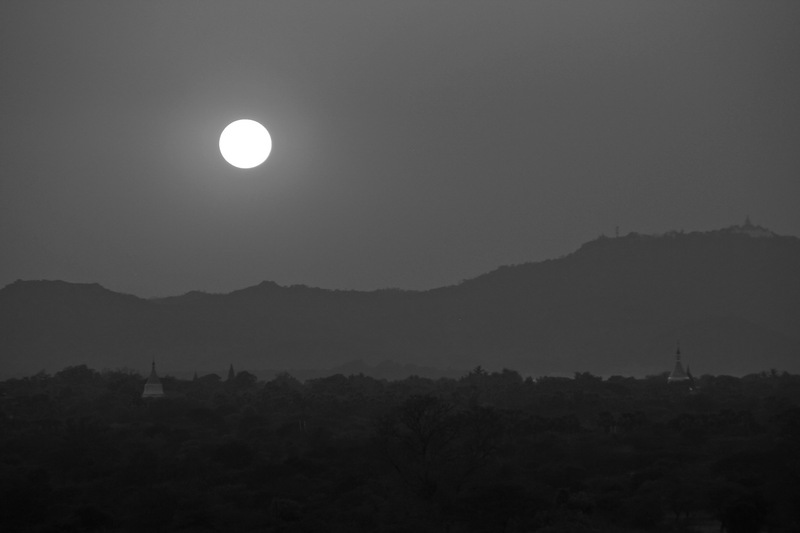 Sunset over Bagan. 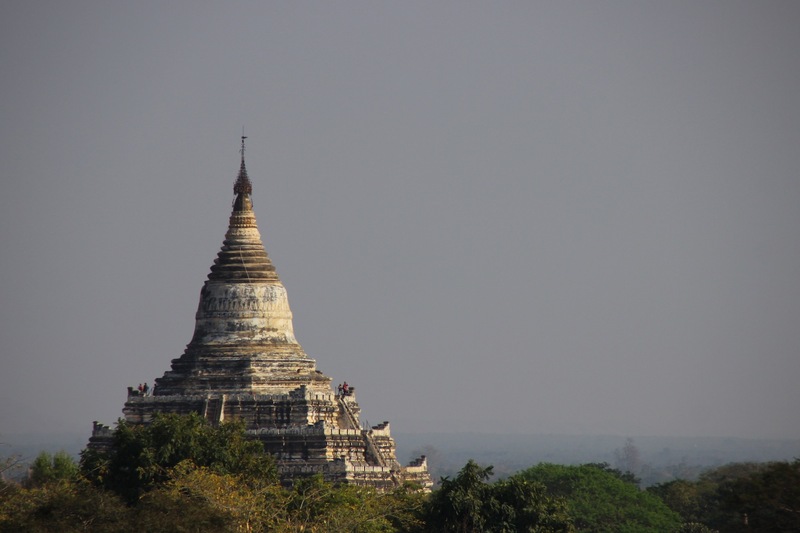 The Bagan plain spans an area of approximately 40 square miles! 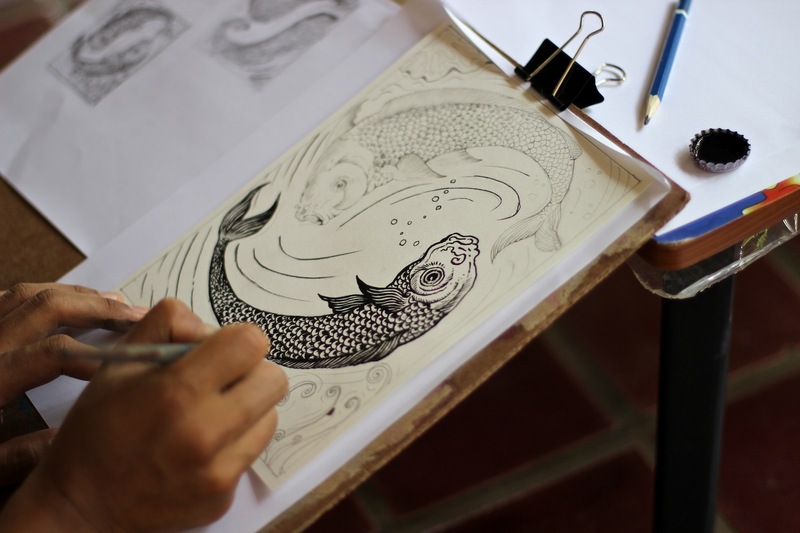 A couple of weeks ago I participated in local Mae Sot NGO Kick-Start Art’s annual auction. It raises funds for the organization by asking local artists to make pieces inspired by an artwork made by one of the school children attending its art programs. I chose two kids’ pieces that humored me– one depicting a joyful banana and another of a sad mosquito. 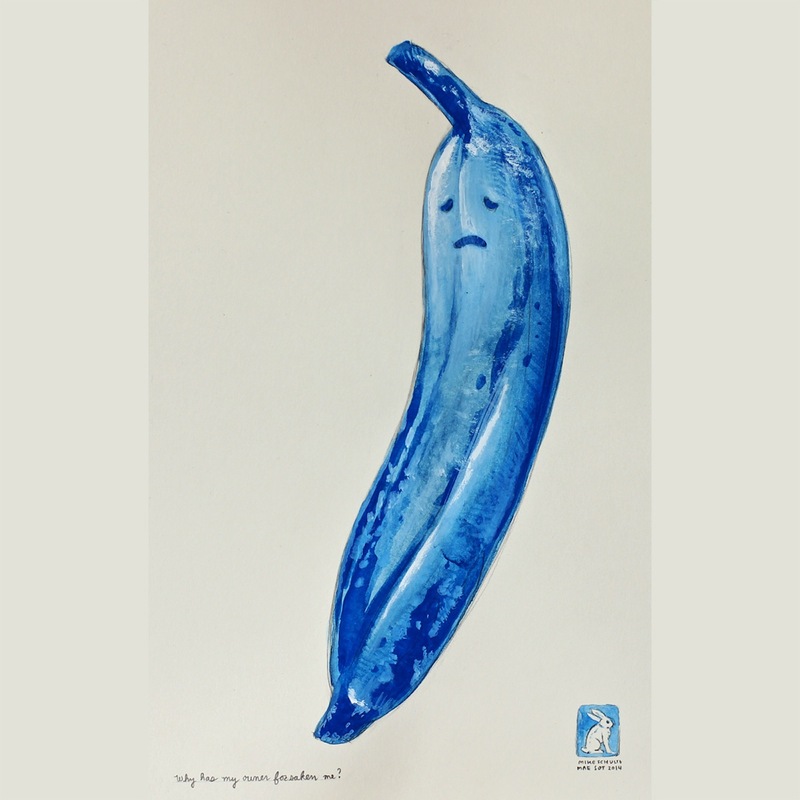 For which to accompany them (and to keep within the logic of the original artwork) I made images of a morose banana and a happy mosquito. It was a lot of fun, and both sold for a good cause. 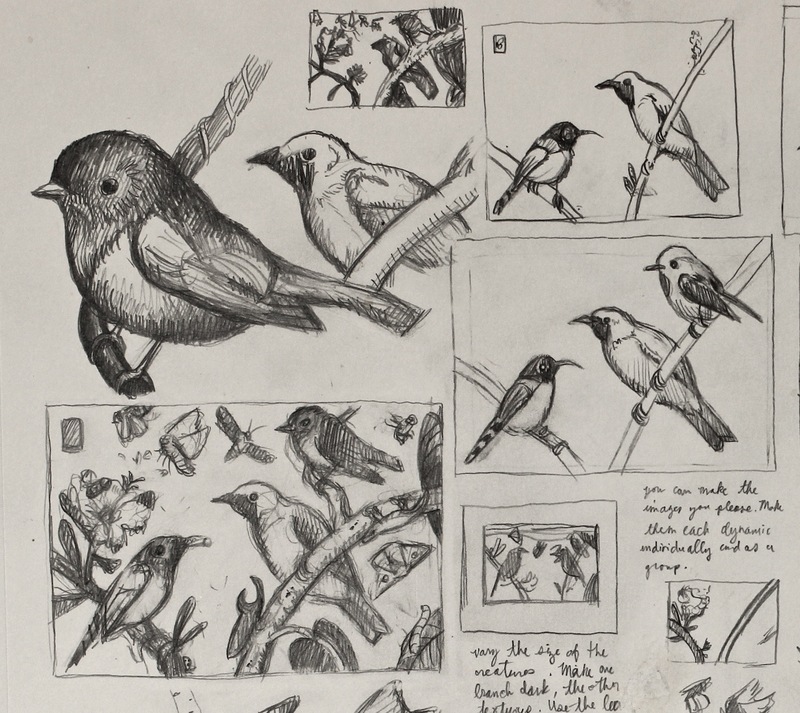 Currently, I’m busy at work on the fourth and fifth Flora Fauna images. 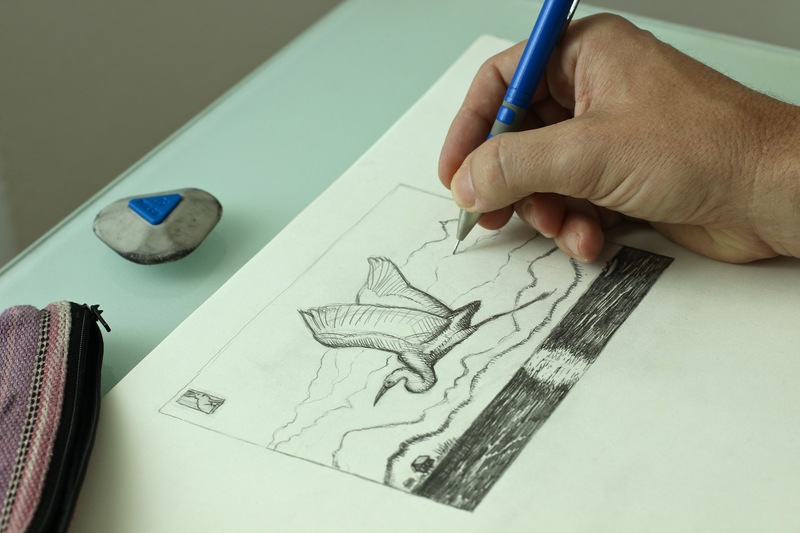 The third image design is complete, but I am giving it a few days for touching up before I share it.